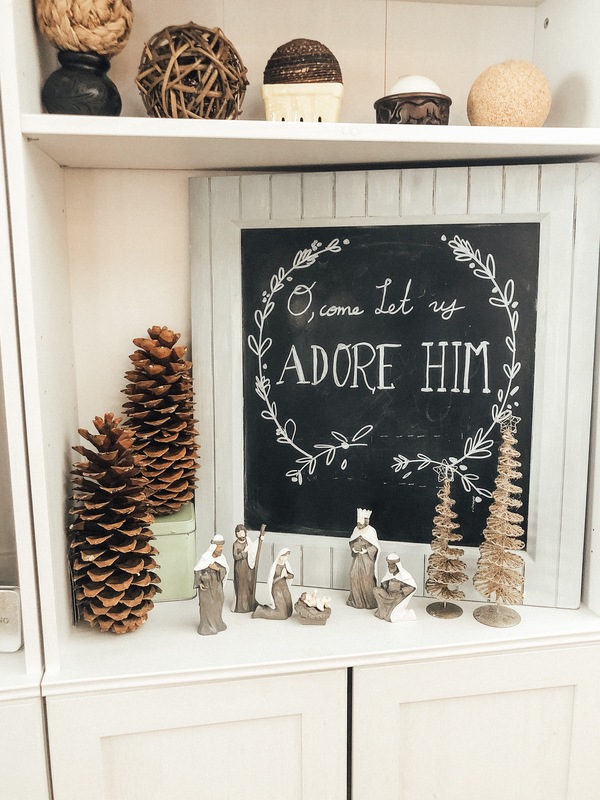 We always love decorating for Christmas! I like comparing this to 2016, 2015 and 2014! 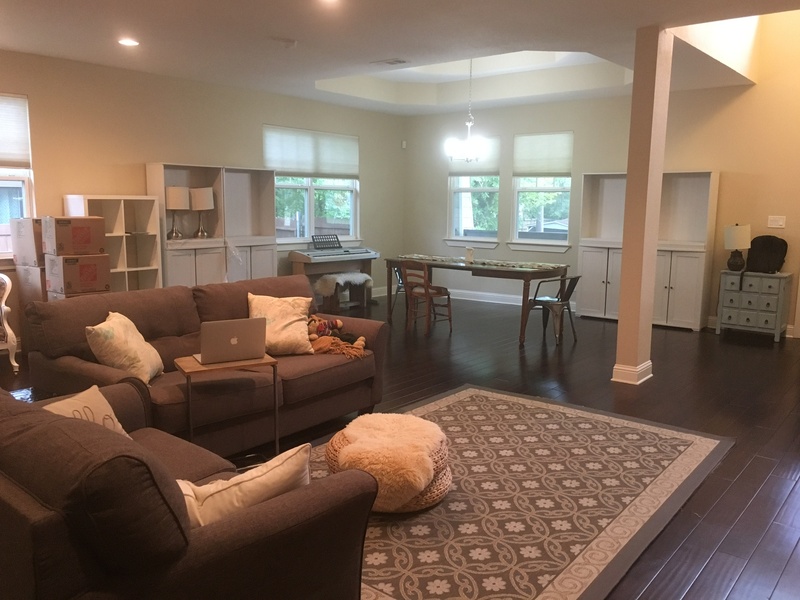 When we first moved into this house about 15 months ago, I had NO CLUE what to do with the ginormous living/dining/family area that was basically one giant loft sized room. 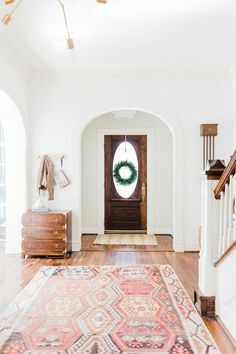 When I first put down our rug from our old house that used to take up the entire living room, it looked comically sad, like someone had put a doormat on the ground. Even the AT&T guy who came to install our internet laughed at it! 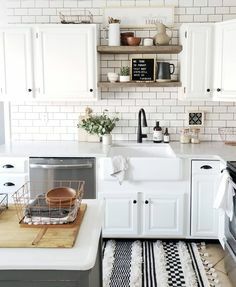 I had NO idea what I was doing, decor wise, and for the first couple months I was terribly homesick! While I appreciated how new this house was (built just 4 years ago, so the insulation is fantastic! ), I missed the quaint homey character of our little 1940s house. This new giant room, in particular, felt like it was actively trying to swallow our stuff. I felt really lost and like I couldn’t even get comfortable. 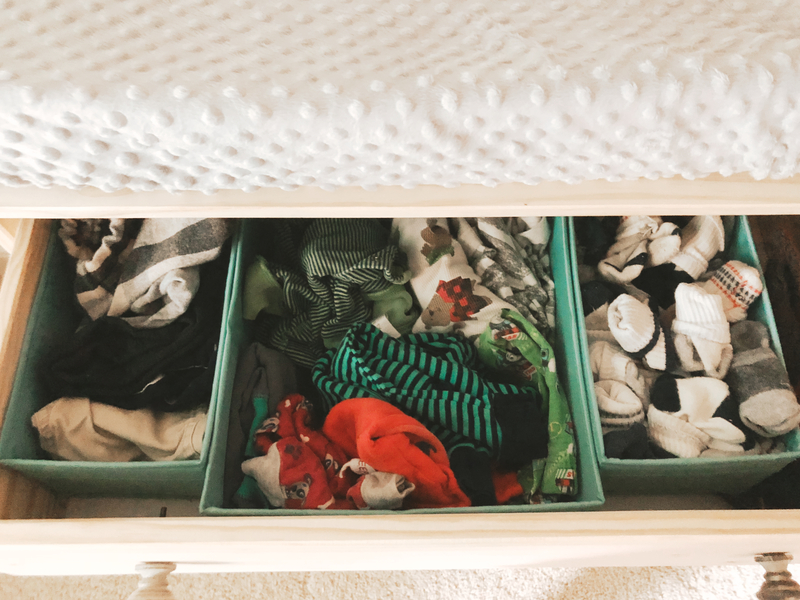 Over the past year, we’ve played with things and moved things around to no end trying to find what “fits”. 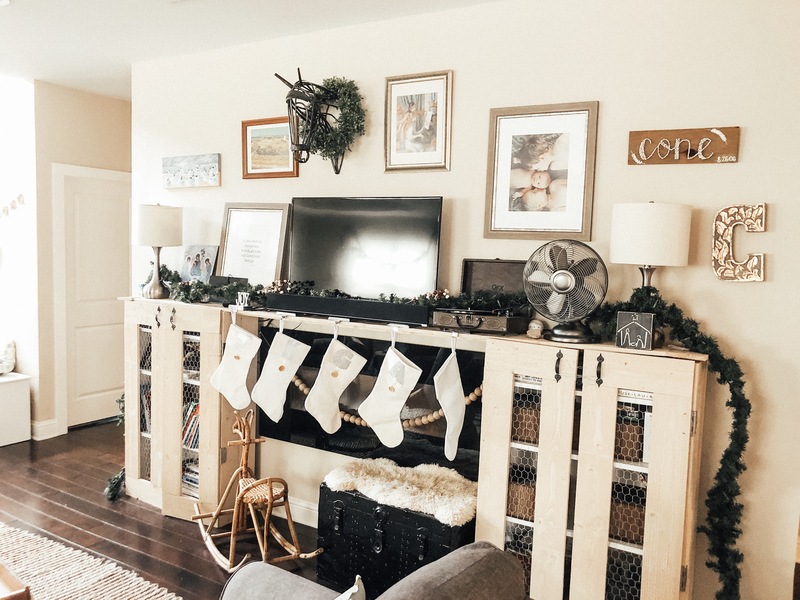 We’ve sold off a lot of our cheap dwarfishly sized Ikea stuff, and opted for only real wood and jute fibers (I have done wayyyy to much reading about formaldehyde and off-gassing to knowingly buy stuff that was going to pollute our indoor air!). 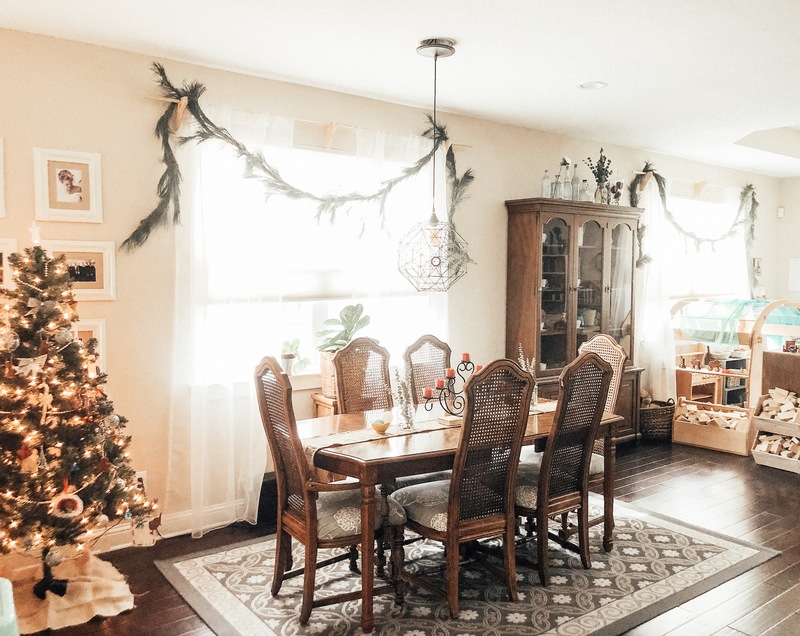 This area by the front door started out as our dining room, mostly because that seemed to be how the house builder intended it (there’s a coffered ceiling and a chandelier here). It only took hosting ONE time before we decided to pull the plug on this location for the dining room. 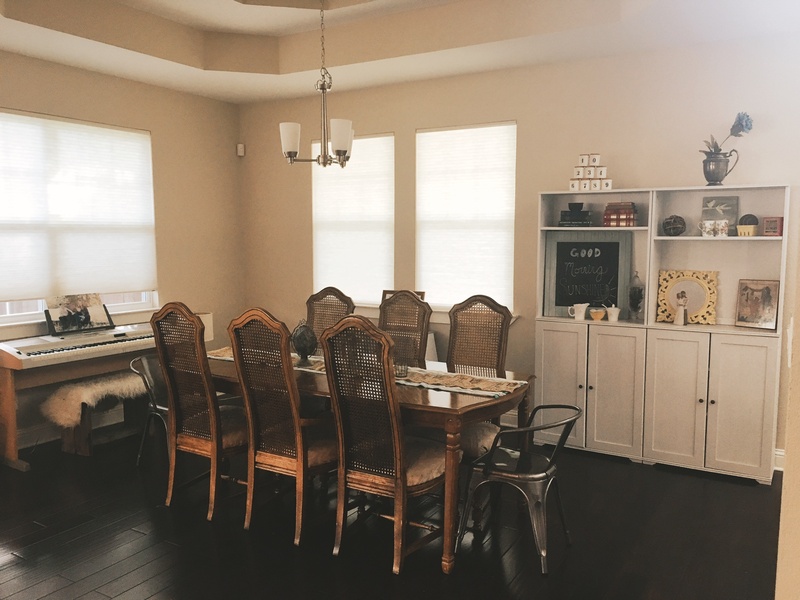 Basically, the dining room table and the kitchen were on opposite end of the house, haha! And carrying stuff back and forth was awkward and weird. 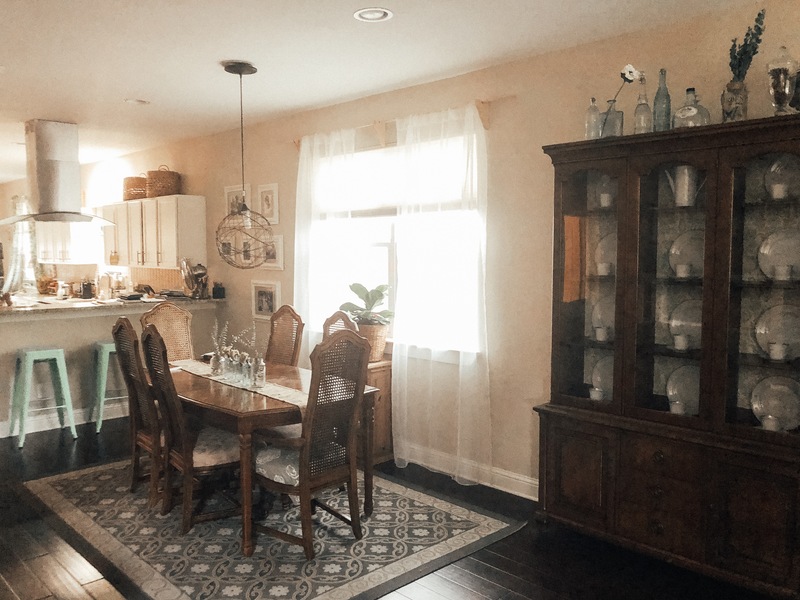 So we moved the dining table behind the couches/living area, and used our old living room rug to section off the space. 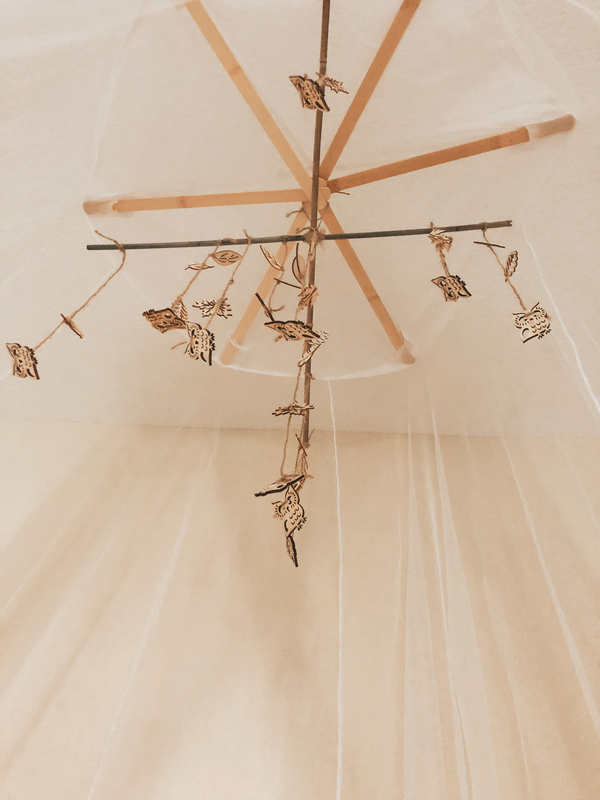 There was no chandelier, but I got this easy conversion light kit from Home Depot, and a pendant light from World Market (similar one here, ours was a return without any hardware, and we got it for a fraction of the original price!). 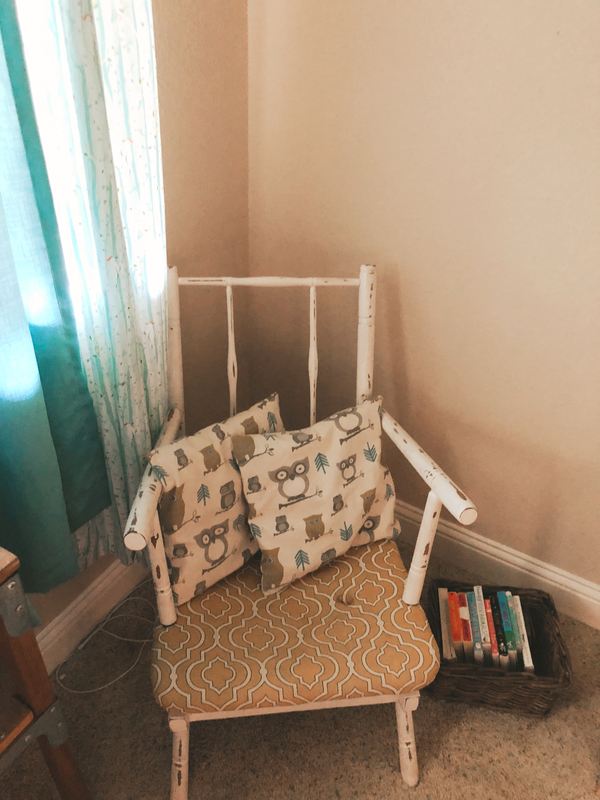 As far as curtains go, there are a billion windows in this house and so we bought wood dowels and brackets from Home Depot and made our own curtain rods using this tutorial! 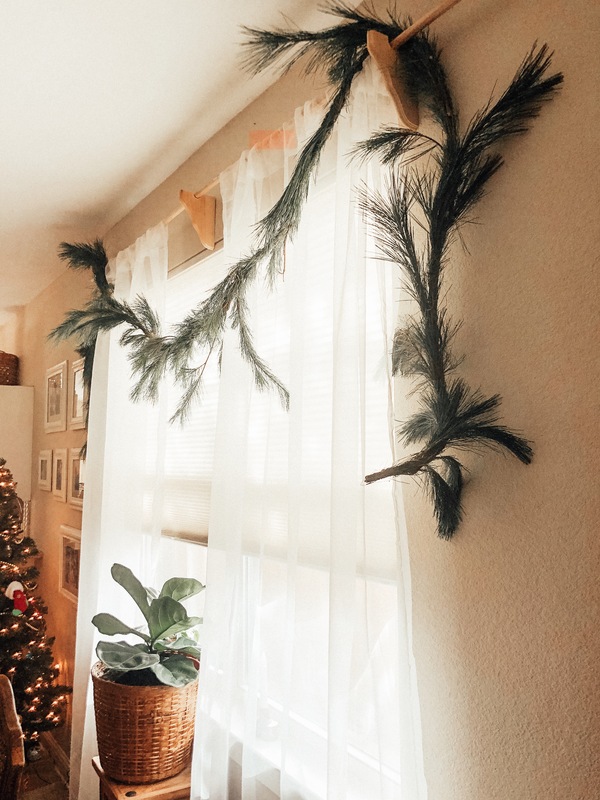 Paired with these sheer curtains from Ikea, we were able to do each set of windows for under $30, vs what I calculated to be around $60-75 for normal curtain rods plus curtains. 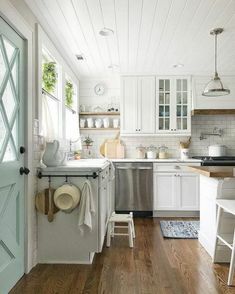 It might not seem like much, until you’re multiplying it by 10-15 different window sets! But enough about the dining room. 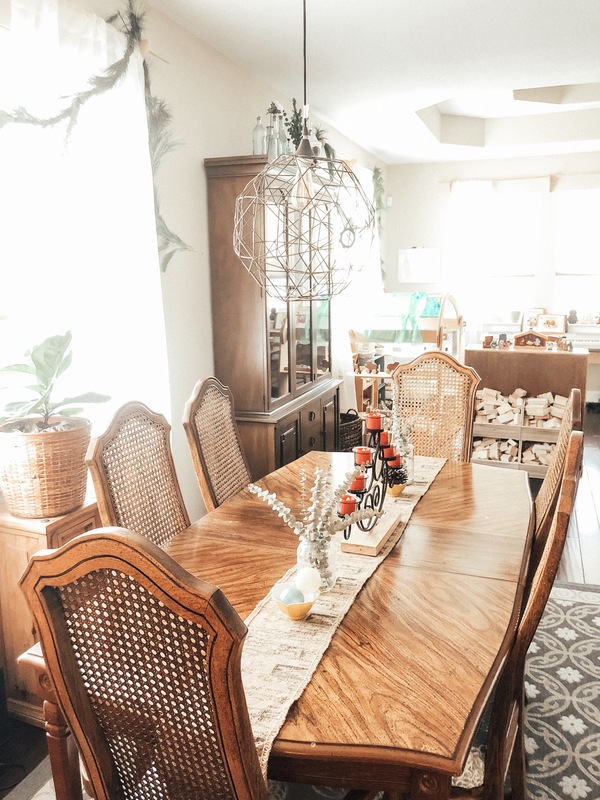 We weren’t sure what to do with this front corner after moving the table, since it was clearly designated as a dining area with the ceiling and chandelier. 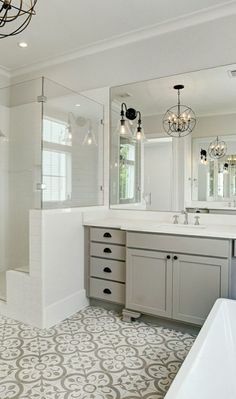 Rather than un-install the chandelier, we simply moved it higher so that it wasn’t as visible. 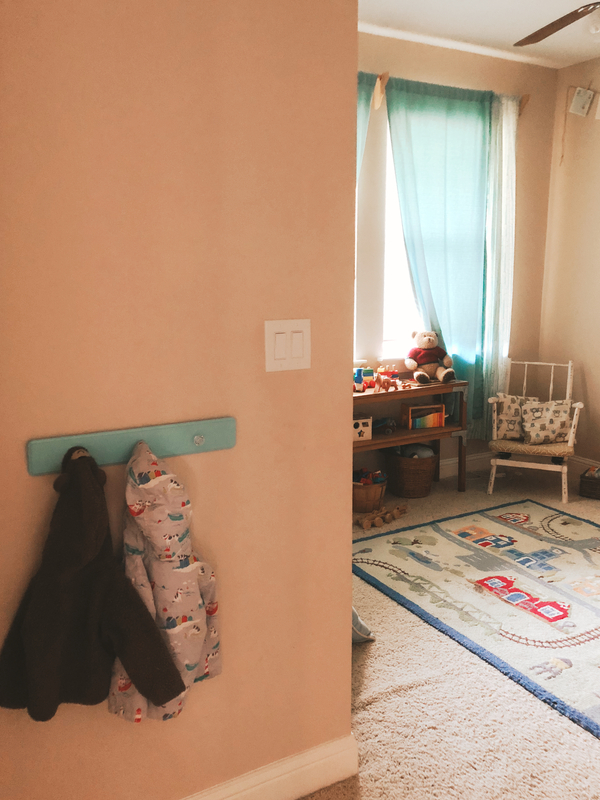 We decided on making it a play area for the boys, especially since Thomas had his cute closet bedroom for a while, so we slowly started filling out the space. I started getting rid of most of our particleboard furniture, and the puppet show got moved into the older boys’ room. A bit of patience on Craigslist can get you some nice homemade wooden bookshelves, I’ve found! 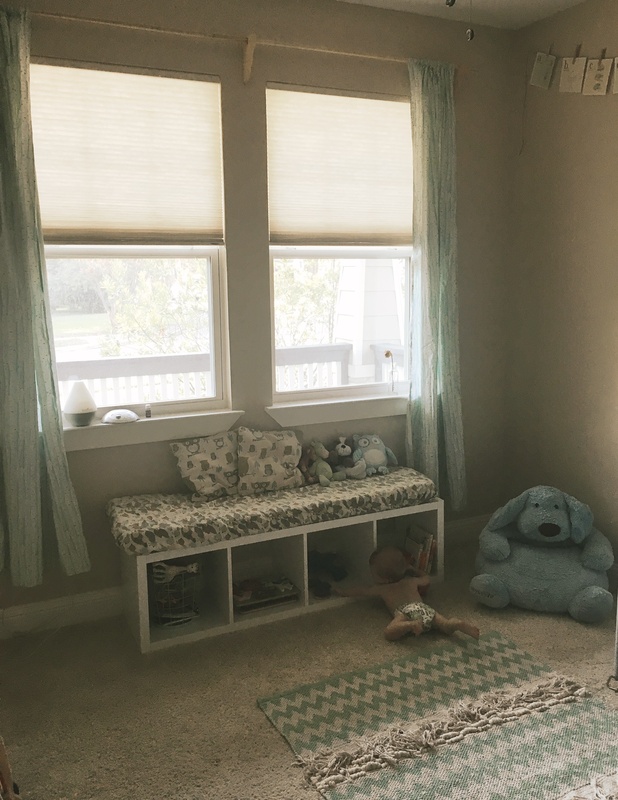 Right as you walk in the front door, you see the reading nook in front of the play area. 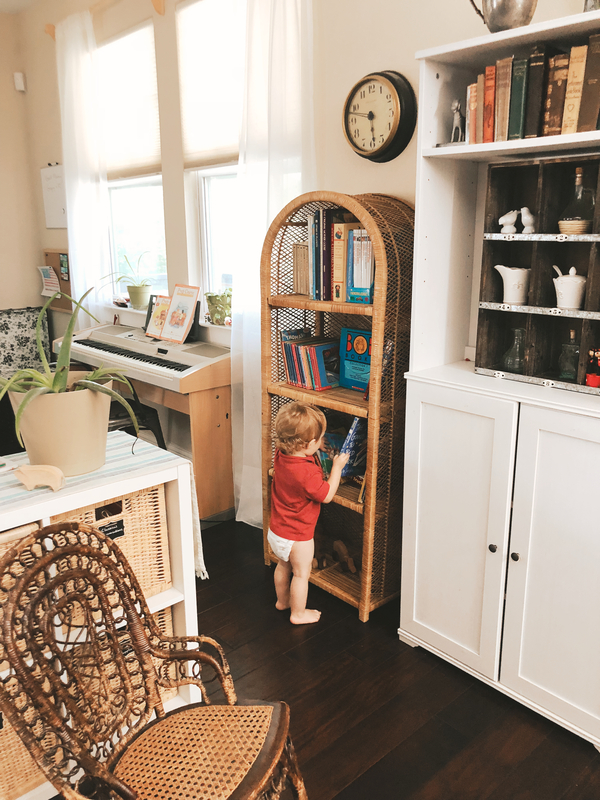 I try to keep the rattan bookshelf organized so I can find what we need. The top shelf is all of our Waldorf fairy tales and poetry, the second shelf is full of easy readers for the older boys, and the last two shelves are Thomas’ board books. I have a whole other bookshelf of books stored away behind that white door to the right, so these are all on rotation. 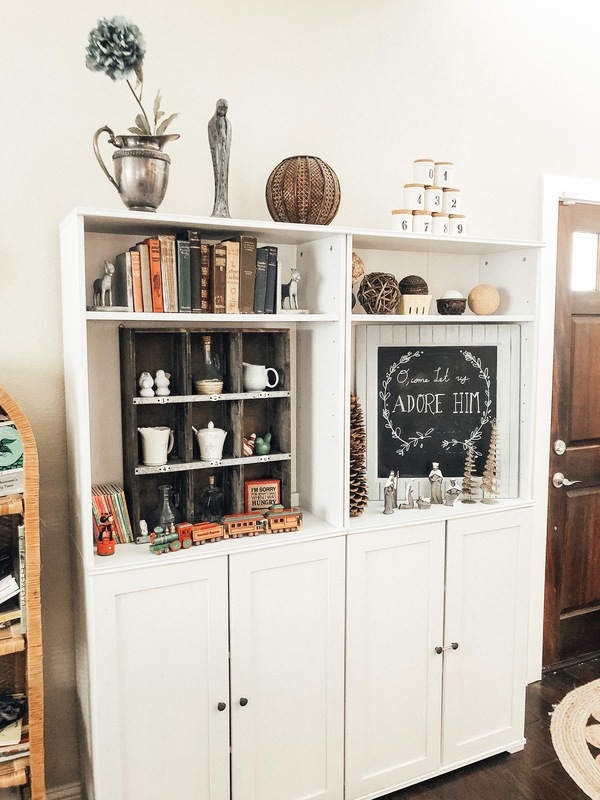 This is the other side of the bookshelf behind the rocking chairs! We don’t have many toys here yet, and I’m find if the shelf basically stays this empty 🙂 Mostly puzzles, duplos and wood trains! 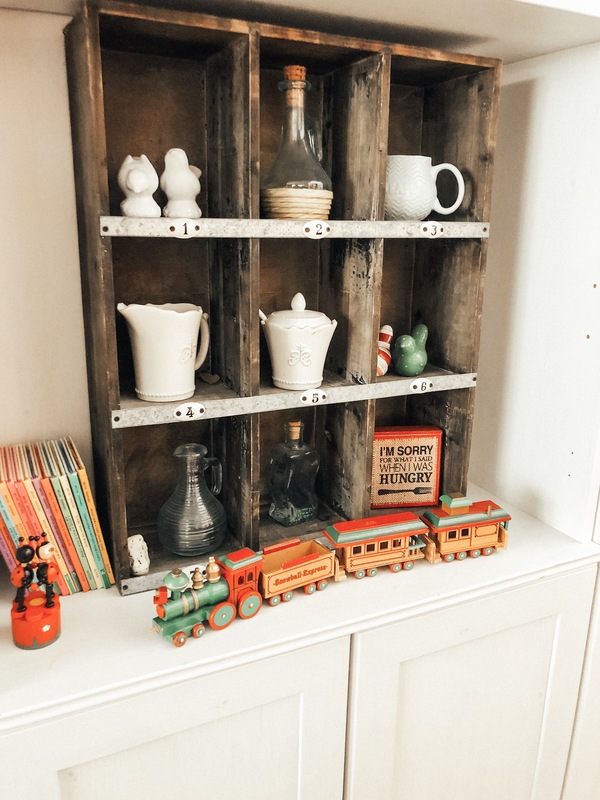 These toys all used to be in Thomas’ room, but he always brought them out here anyways, so now his bedroom has ZERO toys in it and I can keep all the toys in the house consolidated into one spot! 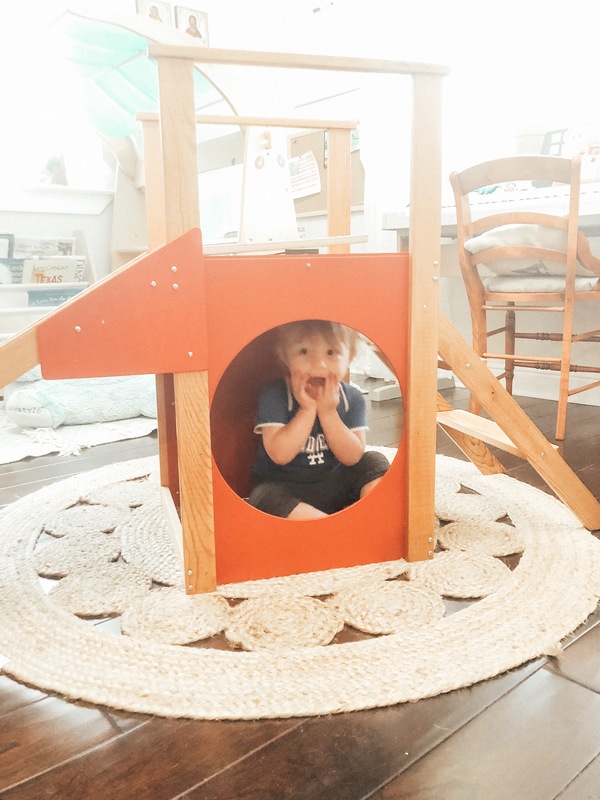 I also love our Waldorf playstand, and love watching Thomas use his play kitchen (he’s the funniest imitator!). 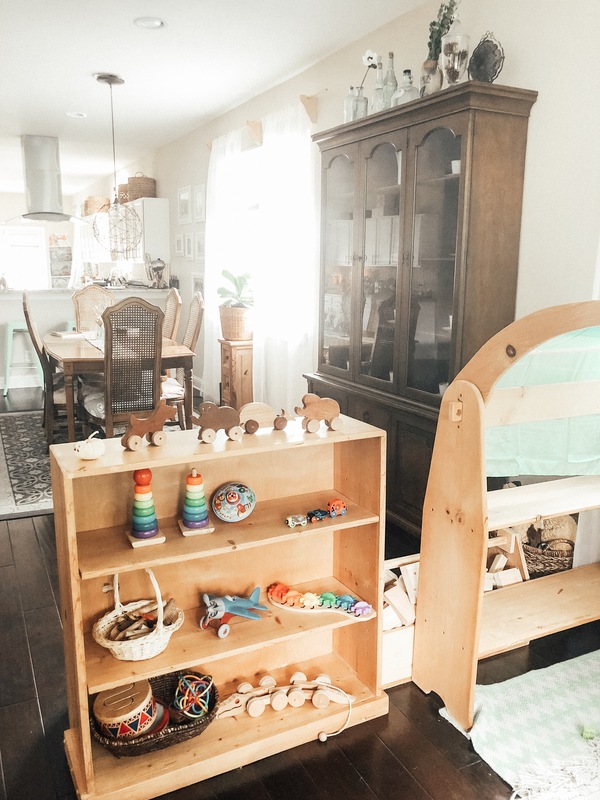 To the left of the playstand is one of the wooden bookshelves, as you look into the dining area. These are literally the extent of 75% of Thomas’ toys. I rotate a few others in every now and then and he has a few at Grandma’s house, but I hate clutter and try to only keep what he plays with, haha! Behind this bookshelf is our homemade block creation area. Thomas’ godmother does woodworking, and she brought us HUNDREDS of these wood blocks, made with the softest birch and pine. Word has it her husband is currently make castle turrets too! Last but not least is our piano! 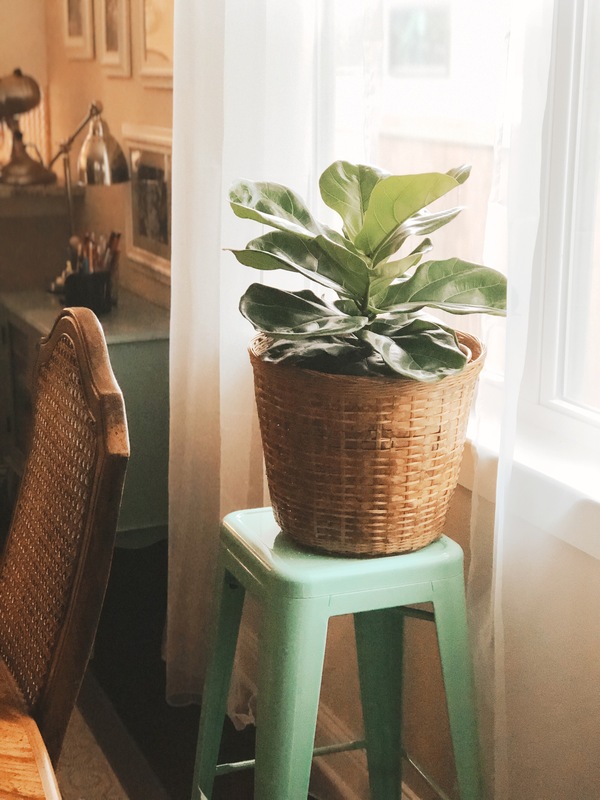 This windowsill is also where we keep our wooden element stackers and our potted plants. 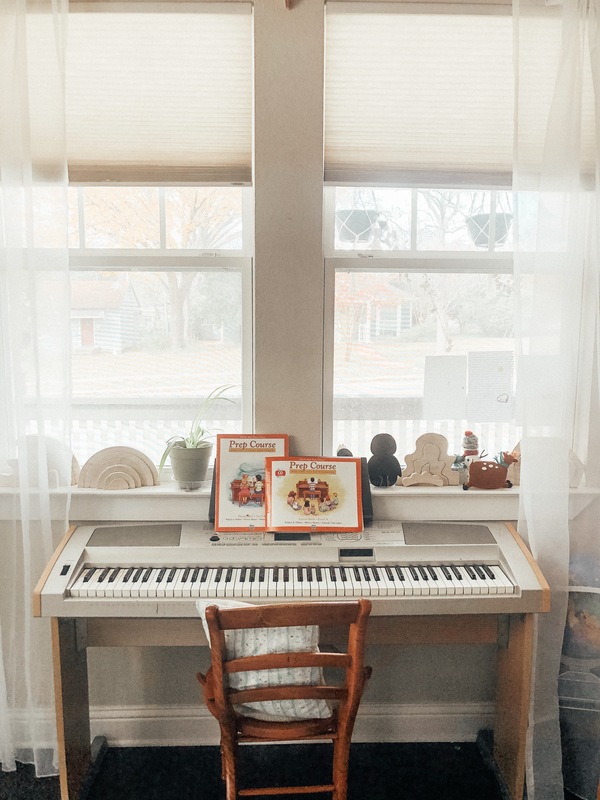 I used to be a piano teacher full-time (you can read my overview of piano curriculums here, it’s still one of my most widely read posts! ), and I’m just now starting to teach the boys. 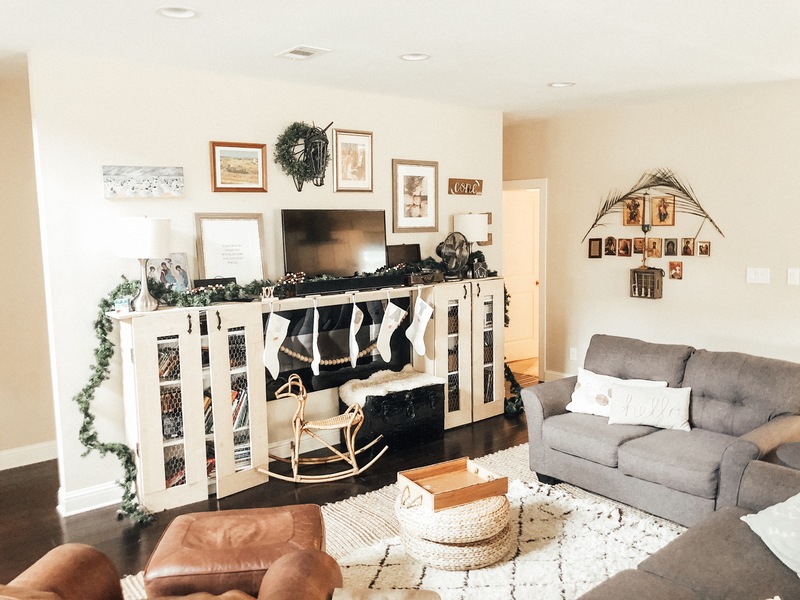 For a little while, we had an indoor red slide that took up residence in the middle of this room! But since Thomas was hurtling himself down this thing and bumping himself on the wood floors, I moved it into his carpeted bedroom 🙂 It’s literally the only toy in there right now! We were planning on moving him in with his older brothers, but last night was a disaster so we’ll see. 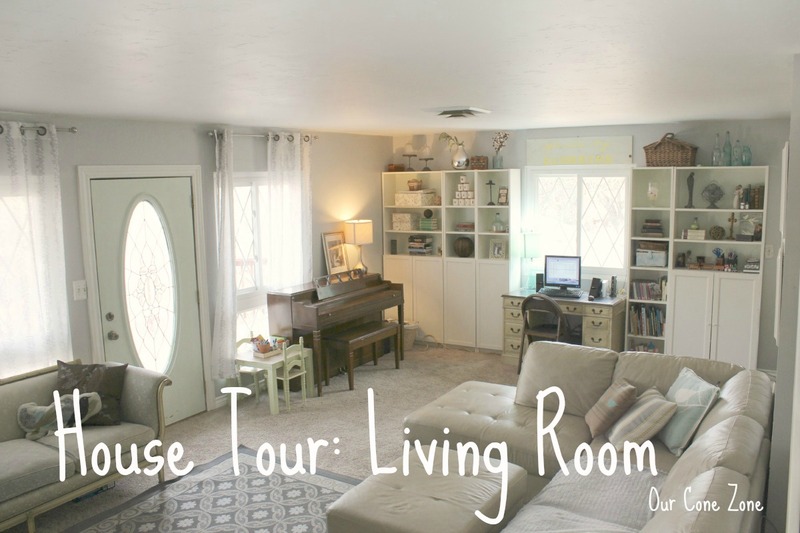 Thanks for reading through our playroom tour! 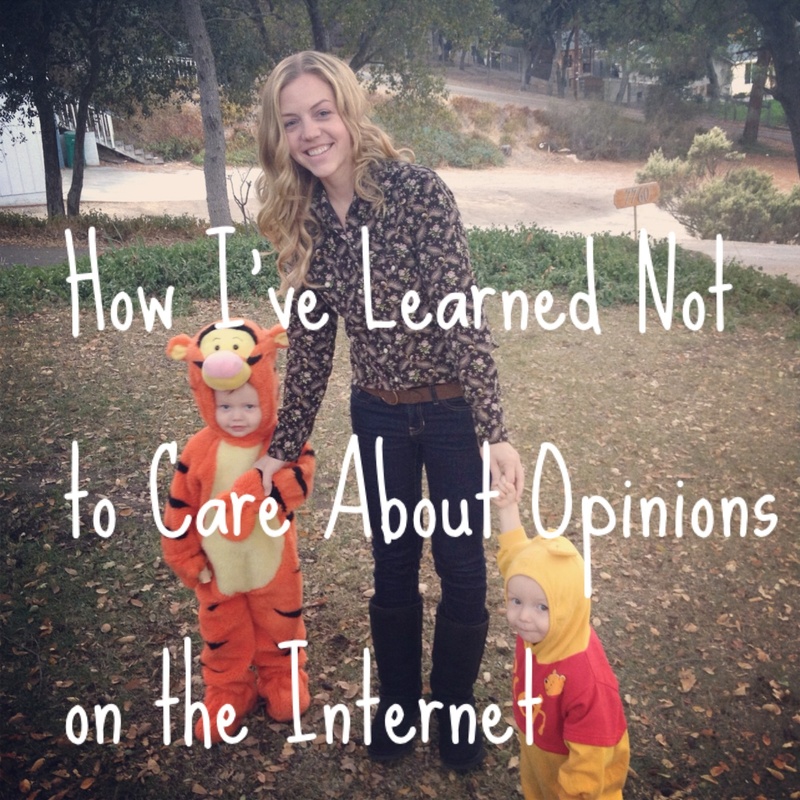 Thanks to all of you who read and loved my last post about why we homeschool! 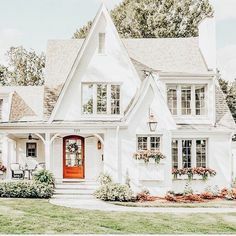 I’ve received an outpouring of comments and questions, and it’s honestly been really refreshing to see that so many others desire the same type of living. 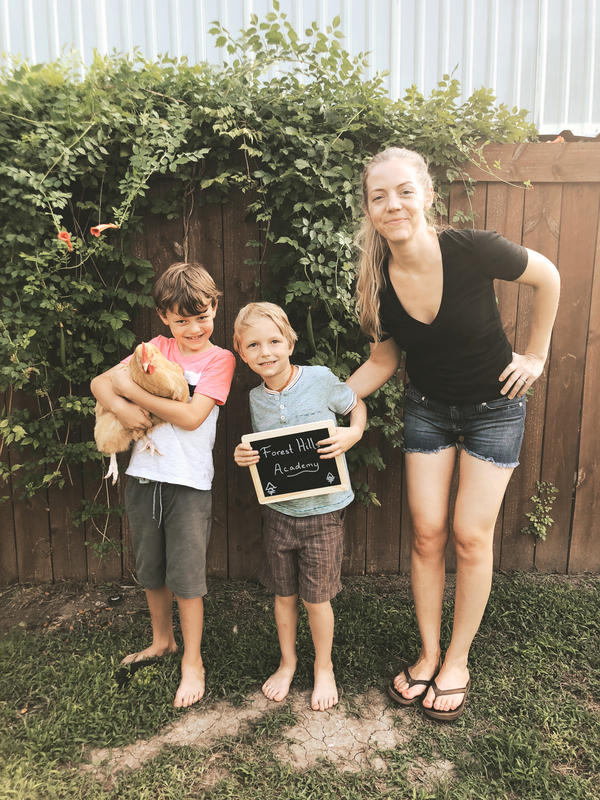 This second part of why we homeschool is even more difficult to write about, because not everyone will agree with what I have to say about these things, primarily education. However, if you keep an open mind there might be something you see that sparks an interest in you, something you want to implement in your own home life with your children, even if you don’t homeschool! I also want to mention that what I have to say is only a crude overview, focusing just on what matters the most to me, because there is no way to sum up 100s and 100s of years of educational philosophy in one blog post. 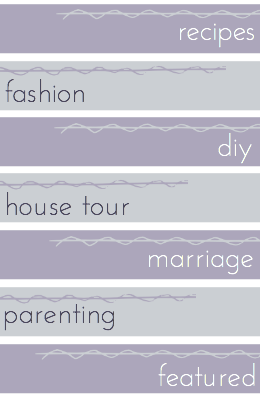 Although we have settled on a Waldorf/Charlotte Mason homeschool curriculum, there are many methods out there! 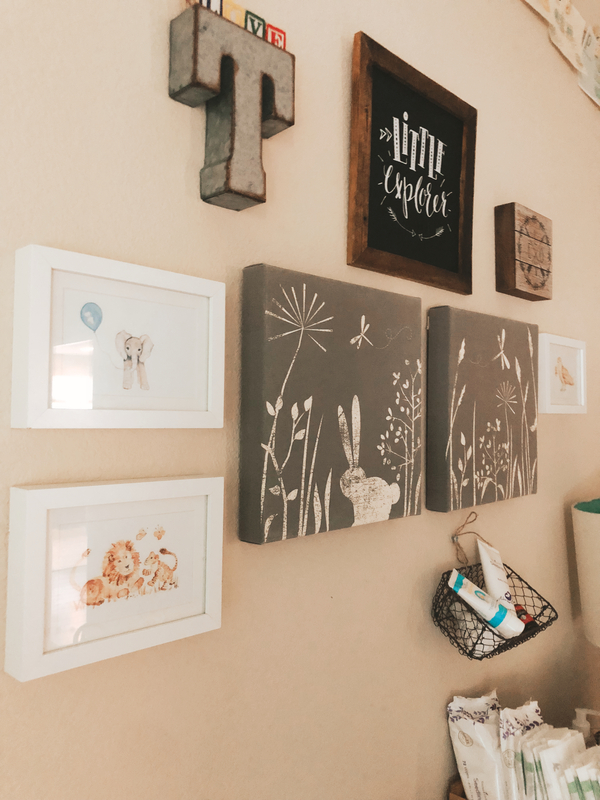 I am a firm believer that all parents should observe their kids and their own family situation closely, and then choose what works for them without worrying about what others think. Parents know their children better than anyone else, and what works for one child may not work for a sibling in the same family. 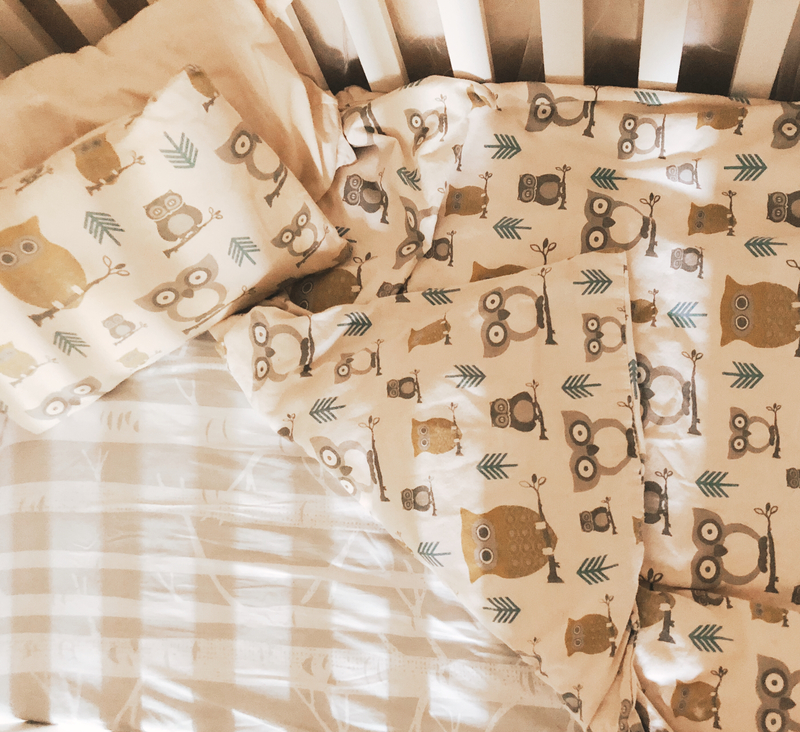 For us, we are sticking strictly with Waldorf for one child, whilst adding in more classical/Charlotte Mason curriculum for the other, because it’s what they need. Educators who strictly adhere to Waldorf teaching know that the greatest curriculum is your child. You should be studying/learning them and making an informed decision based on that, while adding in family needs/circumstances. I’ll start with my own educational journey. Because this is the internet, and people are mean. It’s easy to get criticized when you write down ANYTHING parenting-related, especially if you are doing something counter-cultural. Tensions around education are high in this country, and I think it necessary to spell out that I am no stranger to academics. I don’t claim to be an expert on classical education, but I have years of experience in it, both as a student and as a teacher. 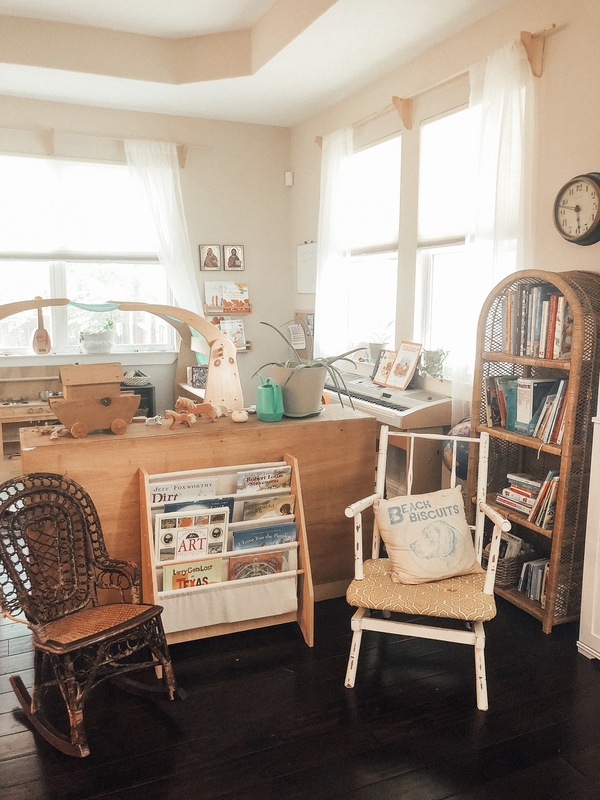 I was never a Montessori certified teacher, but I’ve spent 100s of hours observing it across a few different states and read countless books, so I feel I at least have a large sampling size. I am probably weakest in my knowledge of public school education, as I was only homeschooled through it (aka, we used their textbooks and went on field trips with them), but I have plenty of friends who teach in the public schools and I make a point to pick their brains about what they’ve seen, observed, etc. I started my education at a small christian school for K and 1st. At my Kindergarten entrance exam I read the teacher’s instructions back to her upside down from across the table. This wasn’t a surprise to my parents, since I’d already finished “Little House in the Big Woods” on the preschool playground instead of playing with the other kids (I was already an introvert loner who loved books more than people!). I wrote my first chapter book when I was 6. In 1st grade, they bumped me up to 3rd and 4th grade for most of the day so that I could be challenged, which made my parents decide I was ready for something different. I was then homeschooled through the public school curriculum for grades 2-5 and had 4 of the happiest years of my education. I ran the creeks/woods with abandon, did art projects constantly, learned violin and piano, and wrote thousands of pages of short stories. 6th-8th grade were spent at a small (read: less than 20 people) classical school where I learned Latin, Greek, Spencerian Penmanship, Shakespeare, archery, wood working, art, etc. I skipped 9th grade altogether (tested out) and went straight to 10th-12th at the very same Christian school I had done K-1st at. I graduated at the age of just barely 17, and headed off to the Torrey Honors program at Biola University, where I graduated in 3.5 years. I was married at the beginning of my senior year. From there, I taught high school and middle school English, along with 2 years of 3-5th grade for a small online school. Along the way I also taught music in over 30 different Montessori schools in both CA and TX, and got a MA in English/classics at the University of Dallas. My husband is currently getting his PhD in Philosophy, while also working at one of the largest and most prestigious classical schools in the entire nation. 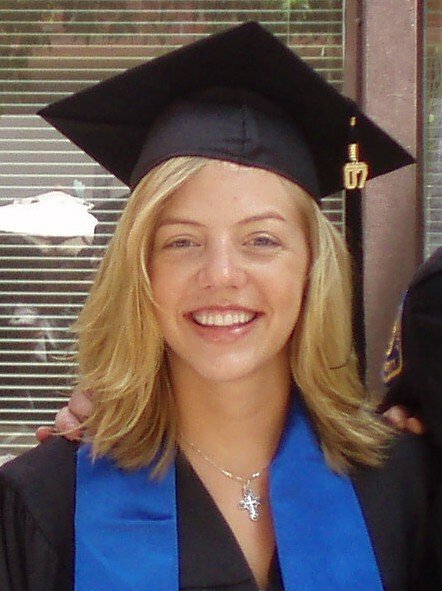 The day I graduated Biola in 2007, right before we moved to TX to start grad school! SO to summarize: I am not an expert, but I’m not a novice. I would categorize myself somewhere in the “well read academic with 100s of observational hours” category. WHEW. So that’s out of the way. Meanies can criticize away! When I was young, I always assumed I would be working at the same school where my kids attended. As the date drew near, however, something wasn’t sitting right with me. I couldn’t put my finger on it, but I decided to try homeschooling. I had almost no idea what I was doing, what I was in for, but I observed my kids and realized that school was not right for them at the time. My 7 year old is an extreme introvert– if he has more than 1 hour of interaction in a day, he then goes into his room and plays by himself for the rest of the day. My 6 year old has a completely different way of learning, and it challenged me early on to look “outside the box” for different educational solutions. I’m so glad I did, because what I found has completely revolutionized the way we operate. Our homeschooling journey has now become one of my deepest joys in life! 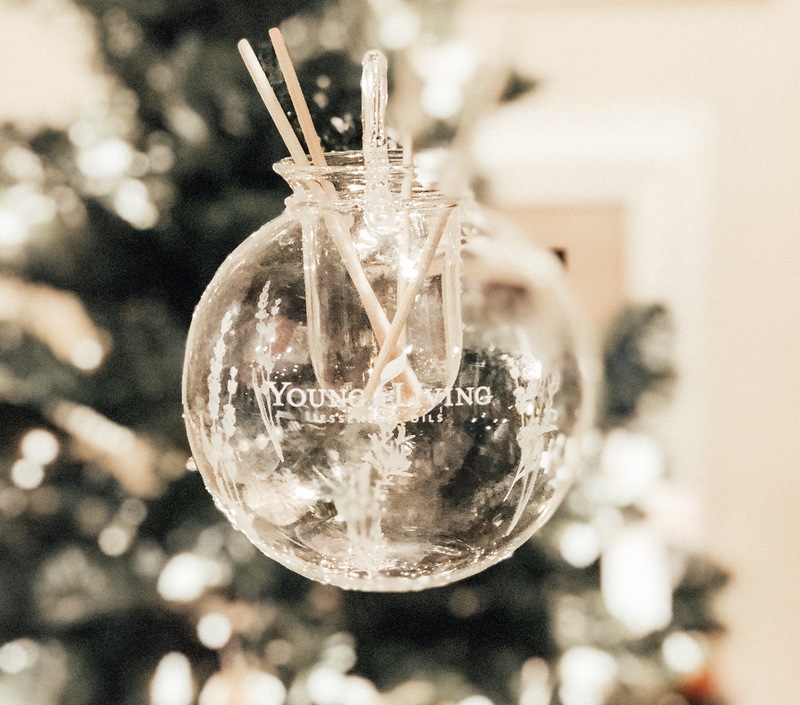 Every year, as I have wrestled with decisions back and forth, Jesse has asked me, “Don’t start with what you DON’T want. Start with what you DO want. What do you want our kids to turn out like?” I love this question, and think it’s an excellent one for any family to consider. We can’t control the outcome, but it sure increases your odds if you know what you’re aiming for. Once you know what you’re saying “YES” to, the “No’s” become less difficult, and decisions become less perplexing (the same goes for schools who need to decide on an academic vision, but I digress). A deep love for Christ and His church. A desire to serve others over themselves. 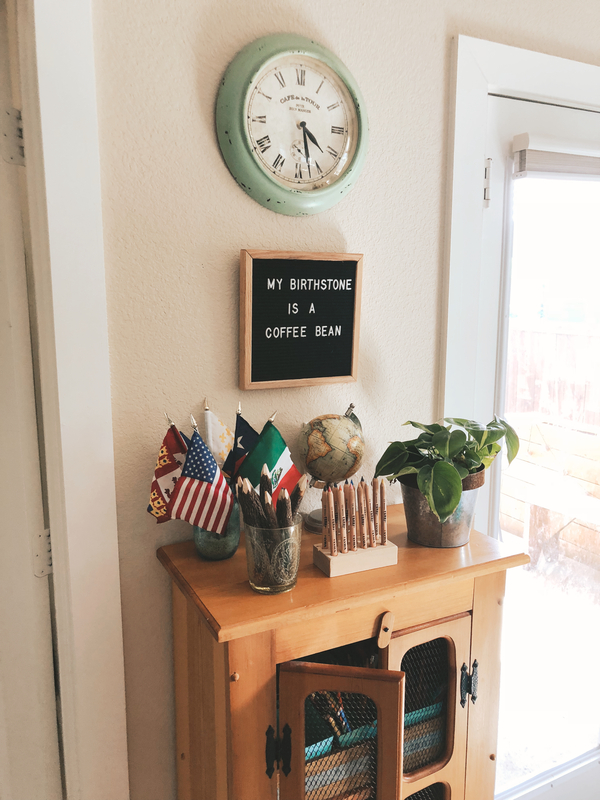 I was familiar with the Montessori method at this point, and as you know from my blog posts, I spent the first year of homeschooling trying to replicate it within our home. 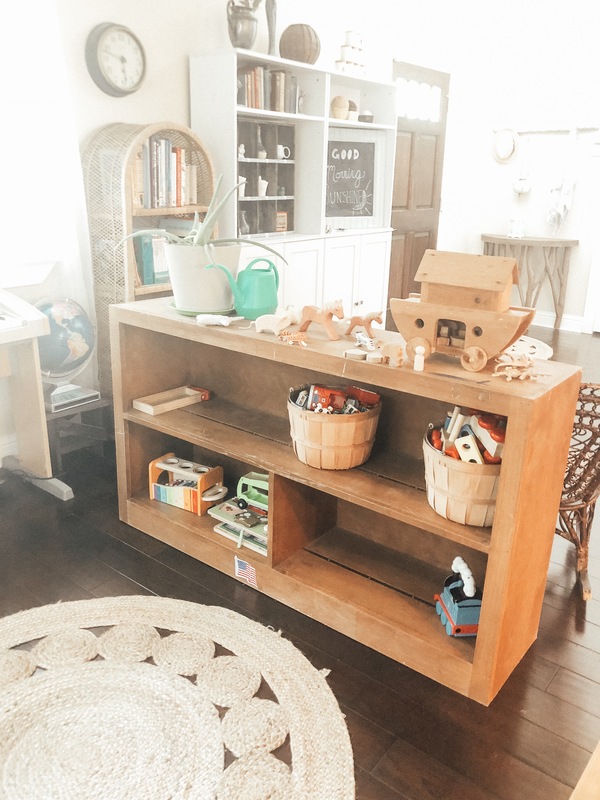 But I saw things I wasn’t pleased with in the Montessori method, one of which is that it is difficult to implement in a homeschooling manner. 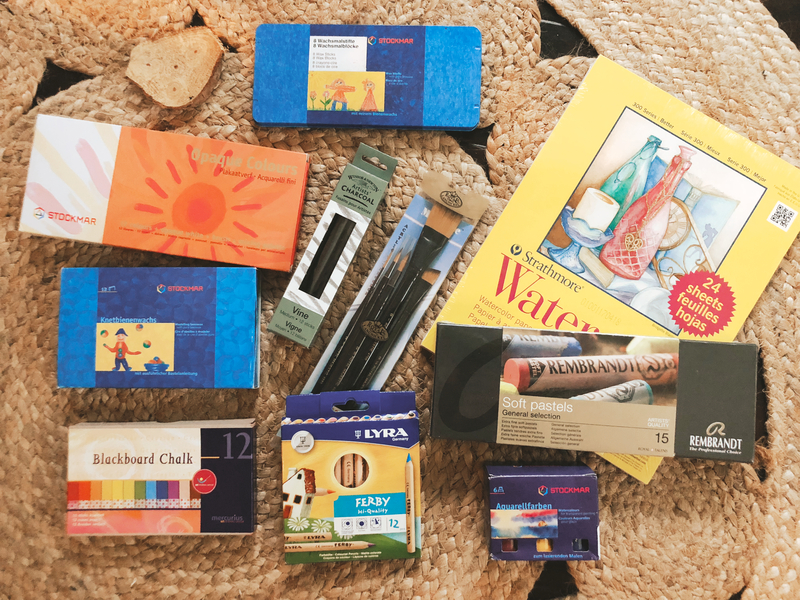 About midway through our first year of homeschooling, I started supplementing with a Charlotte mason curriculum I found online. It was difficult to pin down what we were supposed to be doing each day, however, and I found myself frustrated. At the end of the year, we got accepted to a sweet little Montessori school down the road, and even got a hefty scholarship to go with it. And yet, something didn’t feel right, so I kept them home and kept searching. Year 2, we found Classical Conversations, mostly because we were searching for in person community. 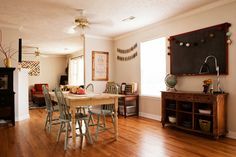 I can see how the method would be very helpful to those who have never homeschooled and think the step by step instructions are great for those who are unfamiliar with classical education. 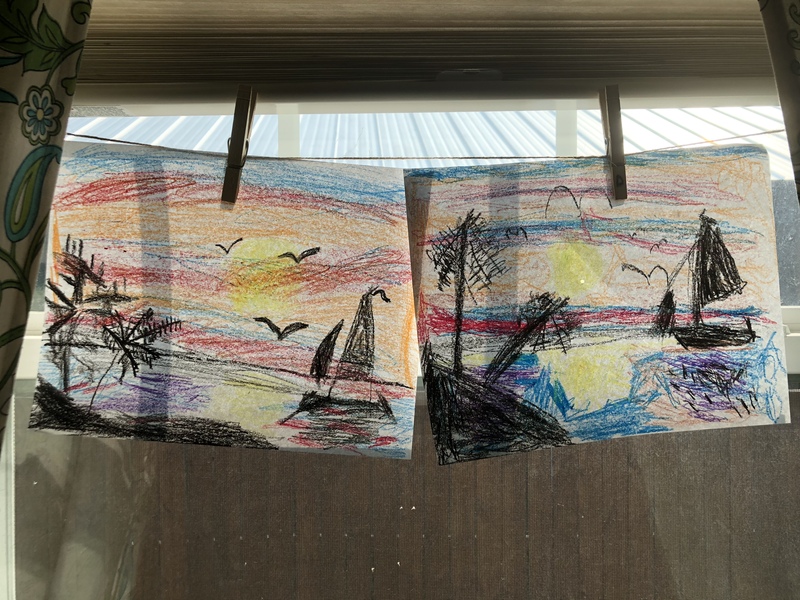 My children did not learn well through the method, however– my 6 year old really really struggled, and was fighting any sort of schooling by the end of the year. 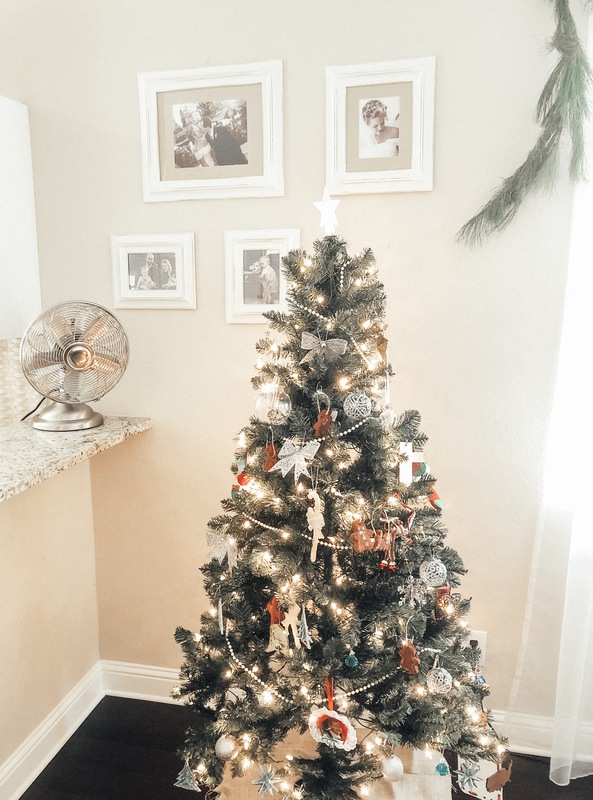 I realized we were failing at the first goal on my list– they were accumulating lots of facts (they can sing that entire 17 minute timeline song, creation to 9-11, verbatim!) but my six year old already hated school. Sigh. Back to the drawing board. I started digging deep and investigating, right at the time a friend of mine mentioned Waldorf Education. I was intrigued, but entirely unfamiliar. My only brief experience had been years prior with a student of mine in my online classroom. I remember getting an email from her mom on the first day of school, saying her daughter had never done any formal reading/writing/worksheets, and they were “Waldorf” educated (to which I thought, what, they eat grape salad?!). 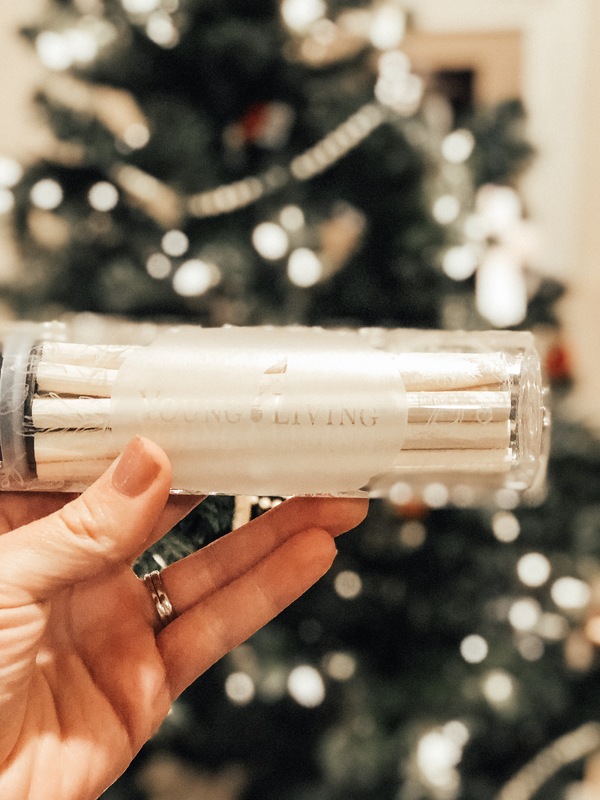 She also said something about the fact that they made their own quill pens and that it might be difficult to read the writing since it was from an ink well! Given that I was teaching a 3-5th grade class, I was, quite honestly, expecting an absolute train wreck of a student. My mind could not fathom a curriculum that didn’t include any sort of formal instruction until the 3rd grade!!! But as the year went on, my “unschooled” student surpassed everyone else in the class. She learned how to write sentence for the first time, and then went straight to writing full essays without so much as a problem. Her vocabulary, spelling and mastery of the English language was that of what I would expect from a high school or college student. What impressed me most was her imagination and ability to think outside the box in discussion– she was ASTOUNDING. I had never seen anything like it. And then I had her younger brother a few years later, and even though I knew what to expect from this “Waldorf” family, I wasn’t prepared for the level of curiosity and intuition I was seeing. When I had the children do a craft project, this child came back with an entire beeswax model that had taken him hours, and that he had done all on his own initiative. His ability to talk about what we were reading was also that of a much older, wiser student beyond his years. Needless to say, it had left a good impression on me. When my friend mentioned Waldorf, I decided it might be something to look into. One of the first things I did was call up this “Waldorf mom” from years past. She told me her children had just been accepted to some of the most prestigious high schools in the nation on full merit scholarships, so clearly their delayed academic schooling didn’t hold them back, haha! This mom (also Orthodox, turns out!) gave me a wonderful reading list to start with and offered to mentor me! The more I read, the more I fell in love. It was as if something I had been trying to put a finger on while groping around in the dark suddenly had a HUGE SPOTLIGHT all over it. I was moved to tears as I read through the curriculum, which is something that has never come close to happening before when I’ve studied education. Something was alive in me in a way that I had never experienced. 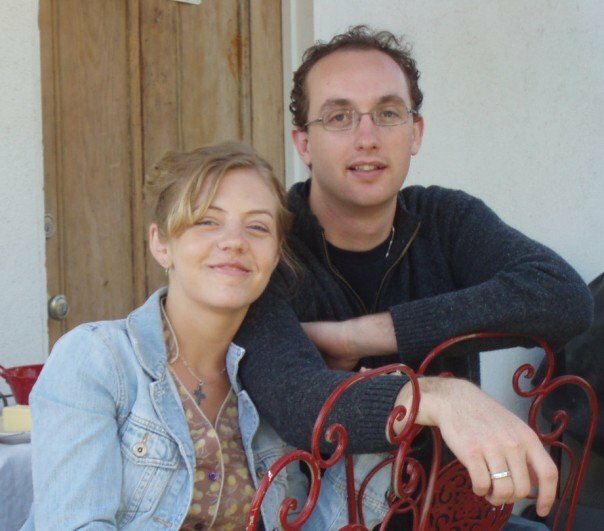 One particularly moving moment was this promotional video for a Waldorf school in Pasadena. So many dots were starting to connect in my brain about why I’d seen certain things succeed and fail over my years in education, and I realized I was onto something. 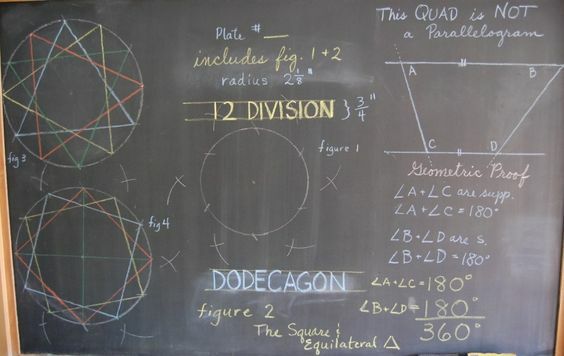 What did I find so appealing about Waldorf education? 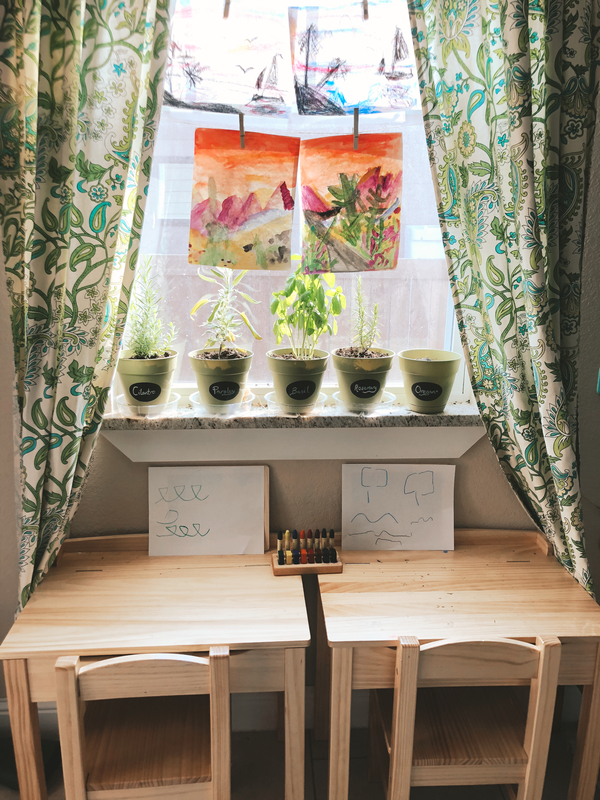 There are a few things that I think set Waldorf education apart and make it special and distinct, even from methods like Montessori that also hold a high reputation amongst parents who are looking for something different. The first is the focus on the imagination above all else. The ability to imagine comes built in to a child, but our culture does not teach them how to foster it. Quite the opposite. The imagination is a muscle, and we must exercise it or it will die. This realization tied in perfectly with what I think to be the reason children hate school. 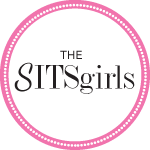 Instead of learning how to grow their imaginations at the time when it would suit them the best, they are taught to sit still and learn real world practical skills that would best be reserved for later. 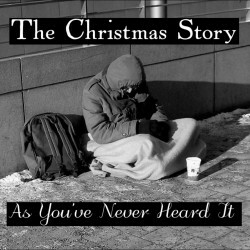 Instead of listening to stories, they are fed them through TV, even “good” TV. Think about it– remember your favorite book as a child? Remember the discomfort you felt watching it put into a movie for the first time? “That’s not how I imagined it”. The imagination is where the spark and the love of learning will reside, and if you don’t have this, you have children who only go to school because they have to, not because it is feeding their soul in any way. 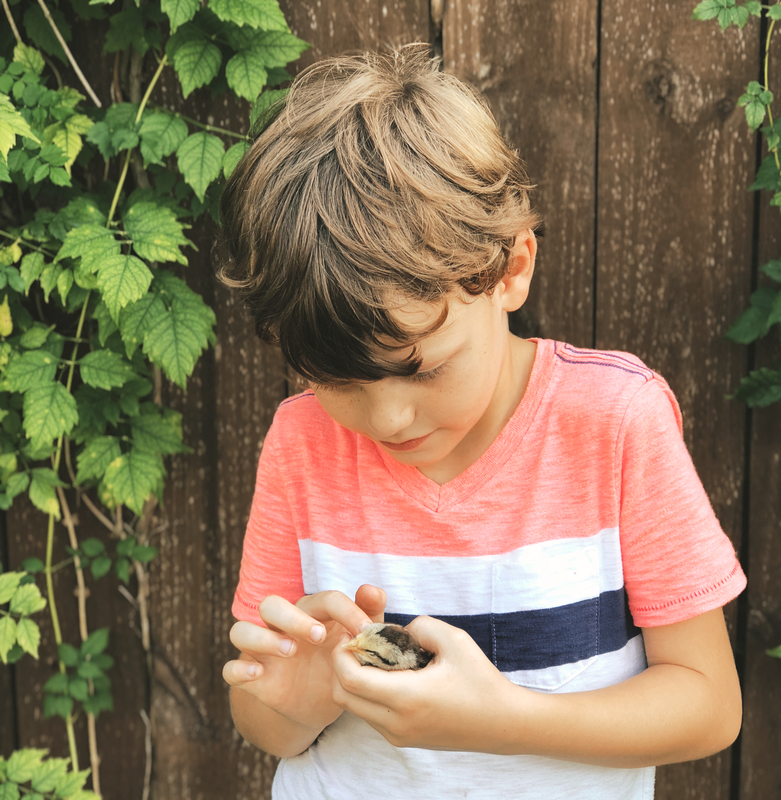 Children who have been taught to imagine will find it easy to adapt and handle many situations later in life, even if they have to “catch up” in practical ways. Once you understand the Waldorf emphasis on Imagination, you start to understand why their toys are open ended. 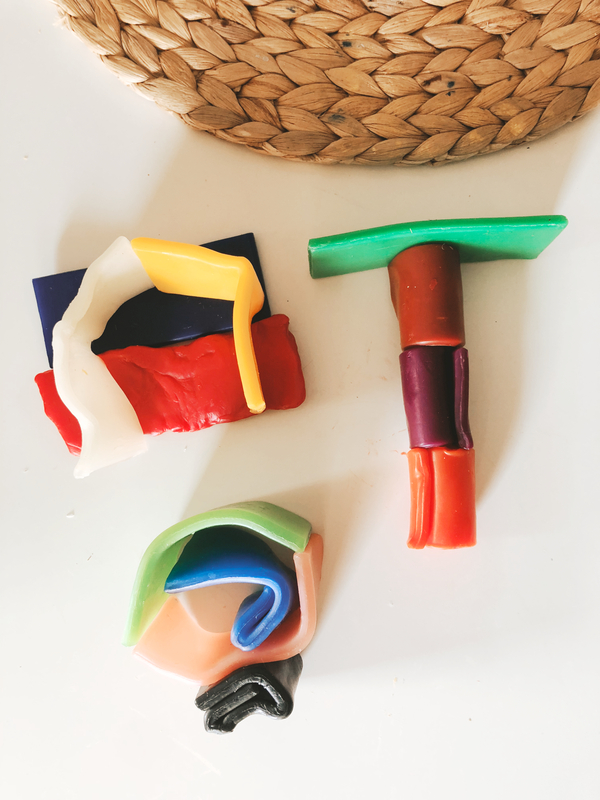 There is more work required on the part of the child, where they are exercising that muscle, than if the toy was super specific and talked for them. Waldorf dolls have no faces– the child’s imagination has to supply the face and the expression. 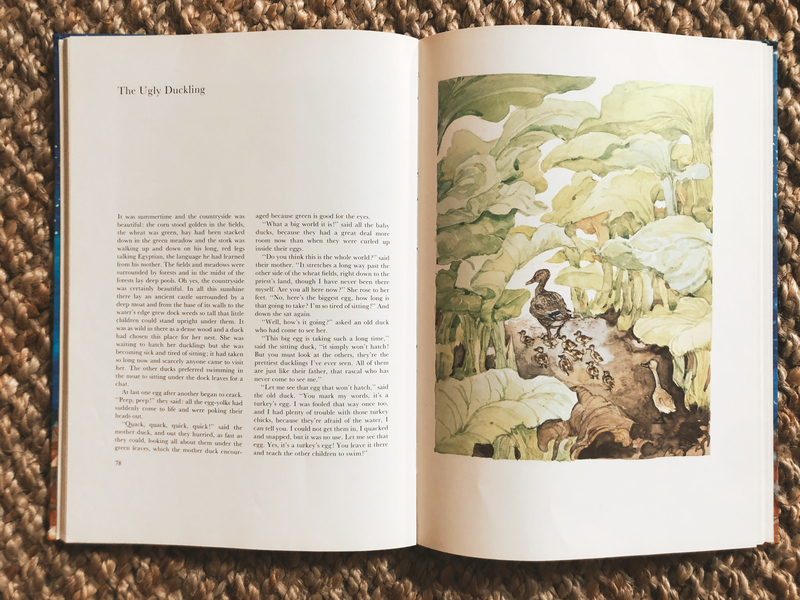 Illustrated books are mostly avoided, unless the art is impressionistic (vague/blurry) to require more work on the part of the child’s imagination. 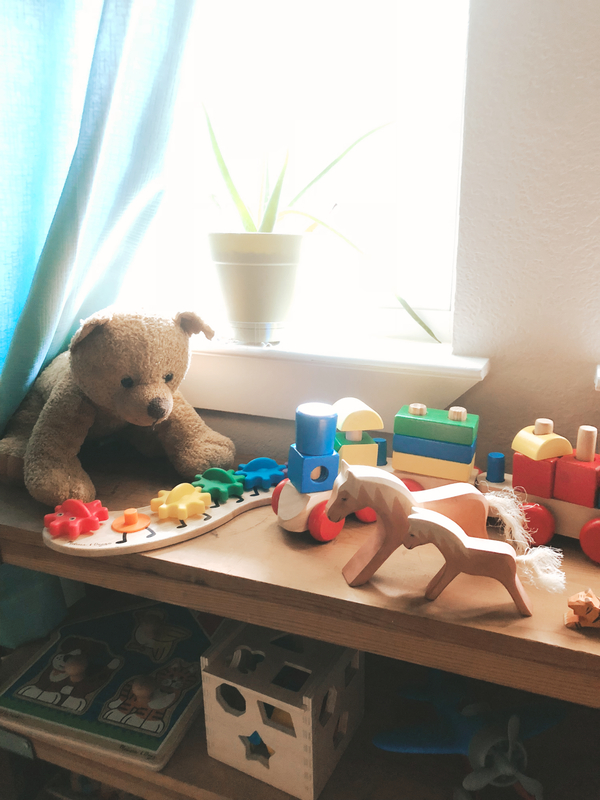 Children will always initially “prefer” the toys that talk, because it requires less work and it stimulates, but this doesn’t mean it’s what best for them. 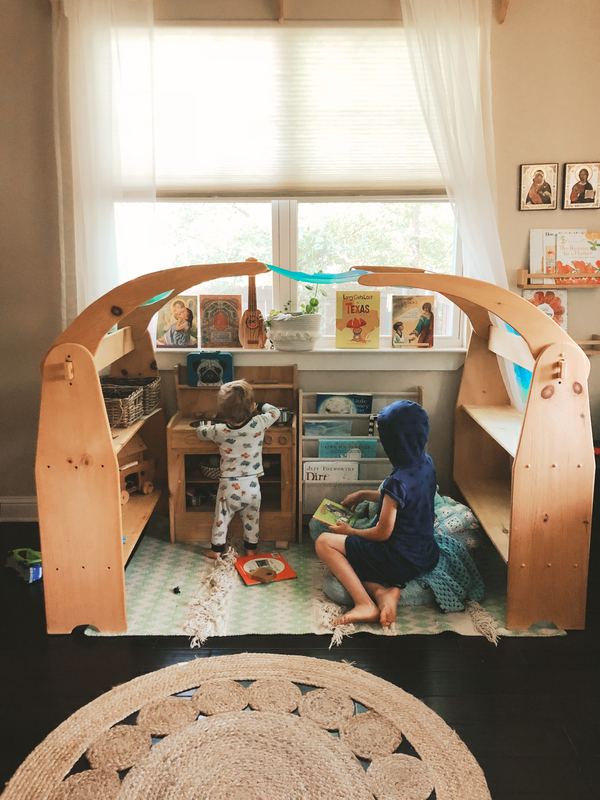 “In thinking of the young child’s free creative play materials, a fitting motto we can keep in mind is ‘anything can be anything’…Children need play materials that are open-ended enough to meet new needs each day, to fill the demands of their imagination. A toy needs to be unformed enough to reasonably used as many things, in many circumstances. For instance, a red fire truck with a remote control will always be destined to be just that. But a simple, open-bed wooden truck can be a fire truck, a farm vehicle, a bus, a lumber wagon, or even a truck that floats on water! 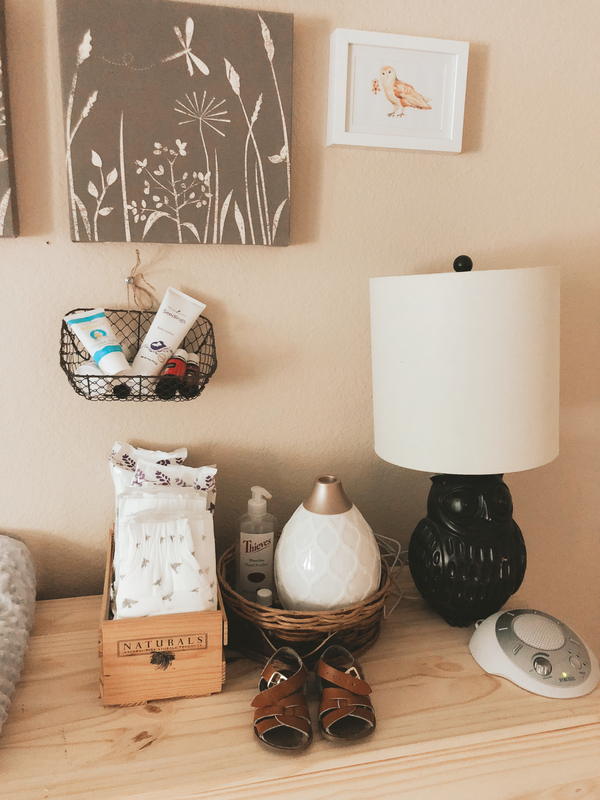 Or better yet, an open basket can be a bed, a suitcase, a grocery bag, a hat, or, when turned upside down, a mountain, a prison, a cave, a hiding place…anything can be anything!” (Heaven on Earth pg. 82). Human nature gravitates towards easy, and it’s our job as parents to teach them resilience and the value in work, even in their play at the earliest ages, for their play IS what will for their minds. 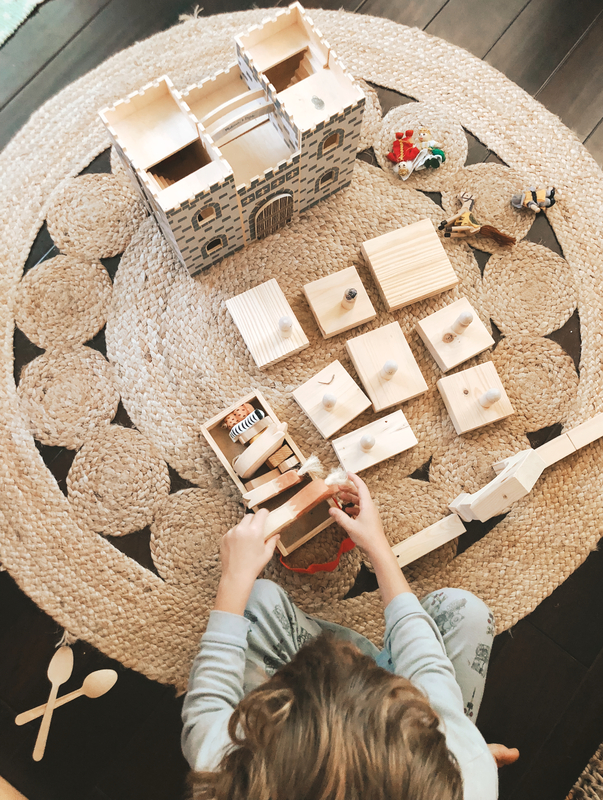 If they see endless possibilities in their toys, how will they view problem solving as adults? But if we teach them to go with what easily stimulates, what comes naturally, what entertains instead of requiring work, they are be drawn towards this in later life. My boys used chunks of wax to make this today while I was typing all of these thoughts out. They tell me it’s a house, tree and human, but they’ve already destroyed it and remade it into something else entirely. 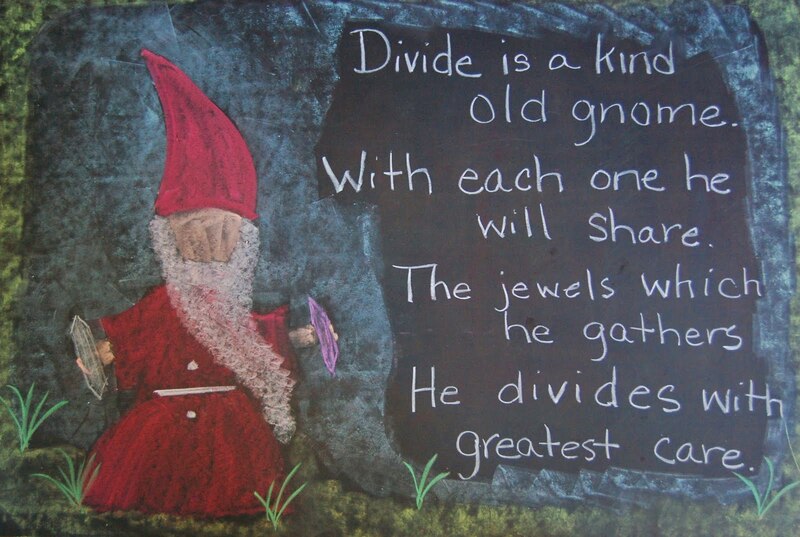 “Through stories, music, verse, movement and art, a child first experiences information physically and soulfully…When teaching multiplication, you can tell a story about a gnome who is saving apples for winter. 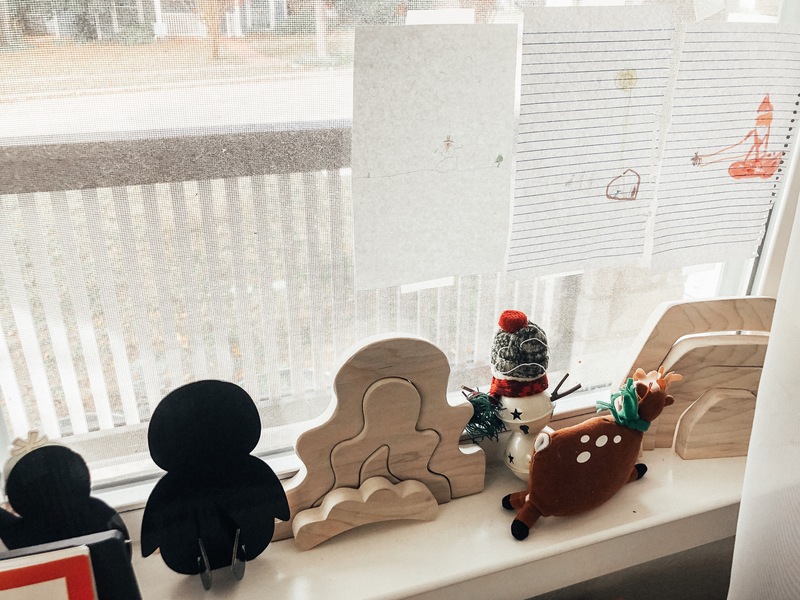 Each of his storage sheds holds four apples, so our gnome will need four storage sheds for his 16 apples…It’s important that the imagery we’re teaching inspires the imagination and sparks the joy and adventure in learning. 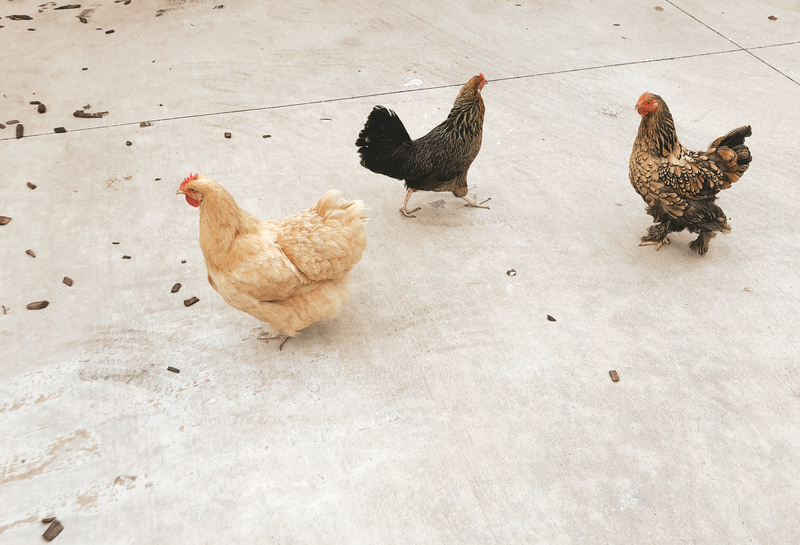 Static imagery produces static thinking.” (Waldorf Homeschool, pg. 20). The second is the focus on Art/Music as a way of learning. Instead of the arts being an elective, added on through an after school program if you’re lucky enough to go to a school with one, they are the means by which all the other subjects are accessed. 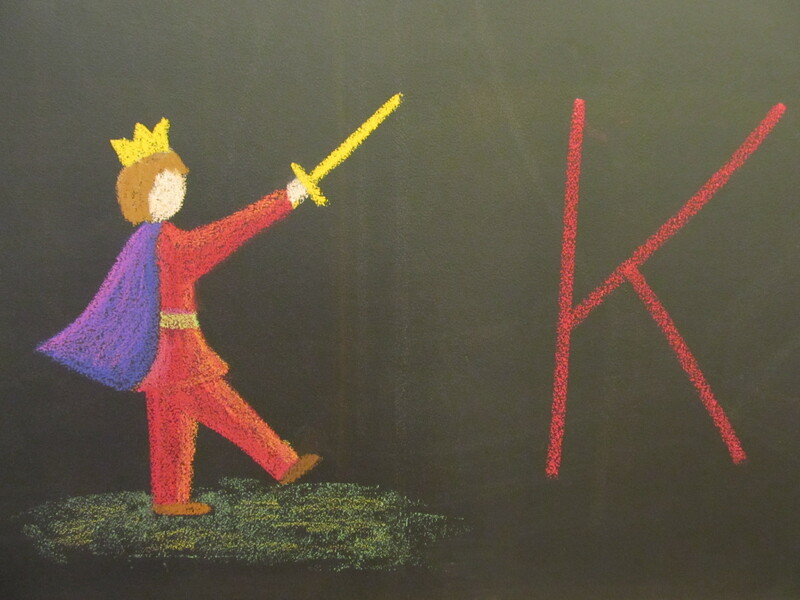 In the early grades, you don’t learn your letters without illustrating them or molding them from beeswax or clay. In the later grades, every book report or essay is fully illustrated. 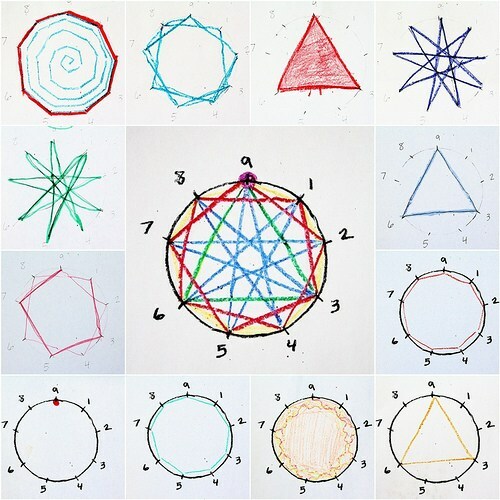 Instead of math worksheets, children learn to skip count through knitting or geometric drawings, even as early as the 1st grade. The drawing below is done with children as early as age 5 as they learn to skip count. 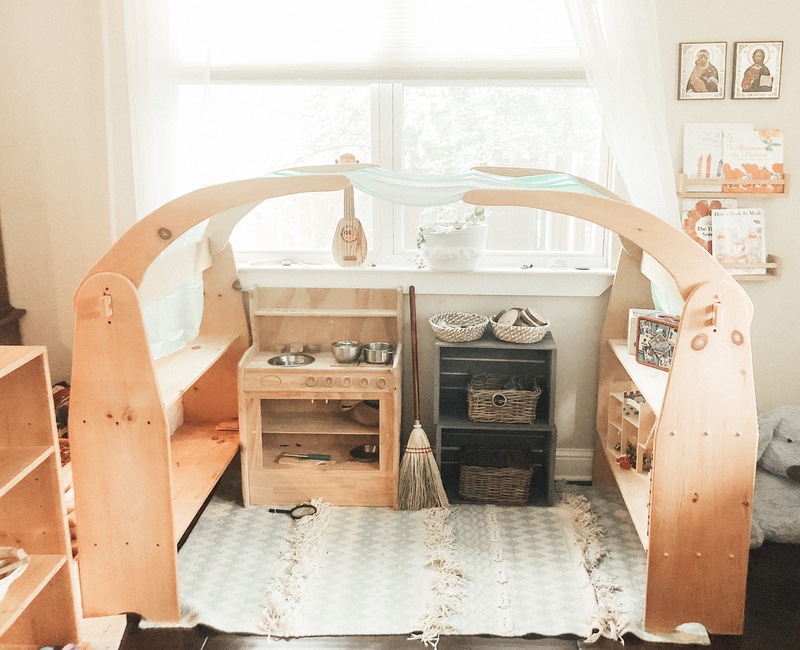 “The Beauty of the Waldorf School is that it is designed entirely to keep children intact until they are ready to move out into the world as whole individuals”. — Joseph Chilton Pearce. 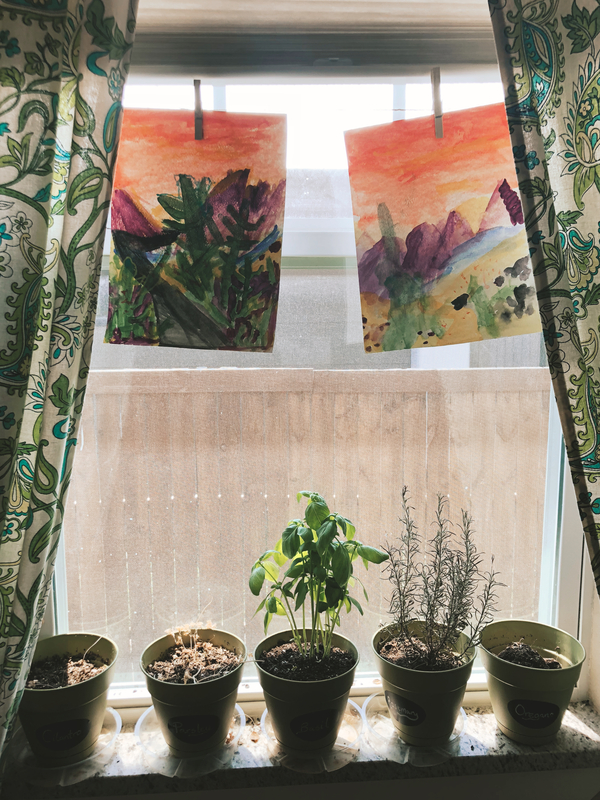 A couple other things I loved about Waldorf Education, from a practical standpoint, was the emphasis on the seasons and holidays that I just LOVE– our Orthodox calendar is exactly the same way. 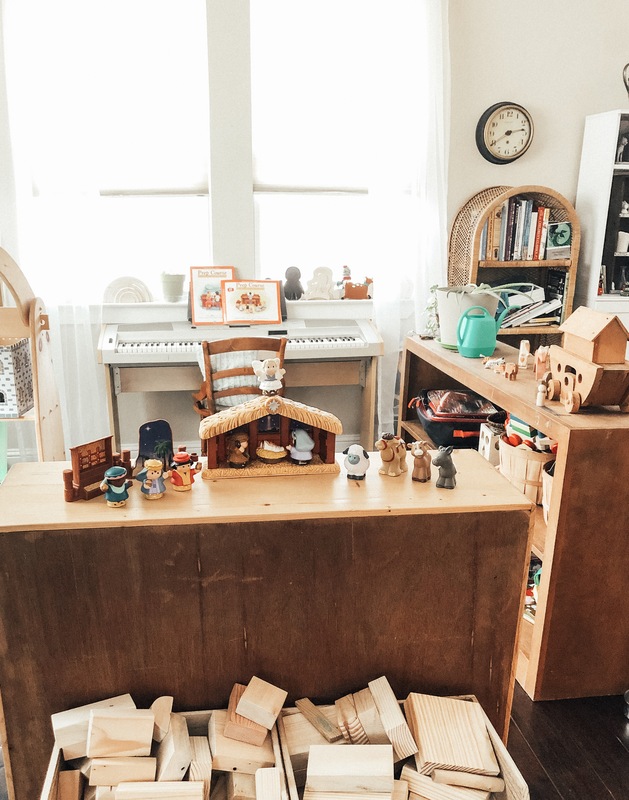 In fact, the Waldorf Education correlates perfectly with what we’re teaching our kids about our faith (for an example– the entire 2nd grade year is focused on stories of the Saints, alongside other moral instruction). The emphasis on a liturgical rhythm to one’s day was another huge “aha!” moment for me. 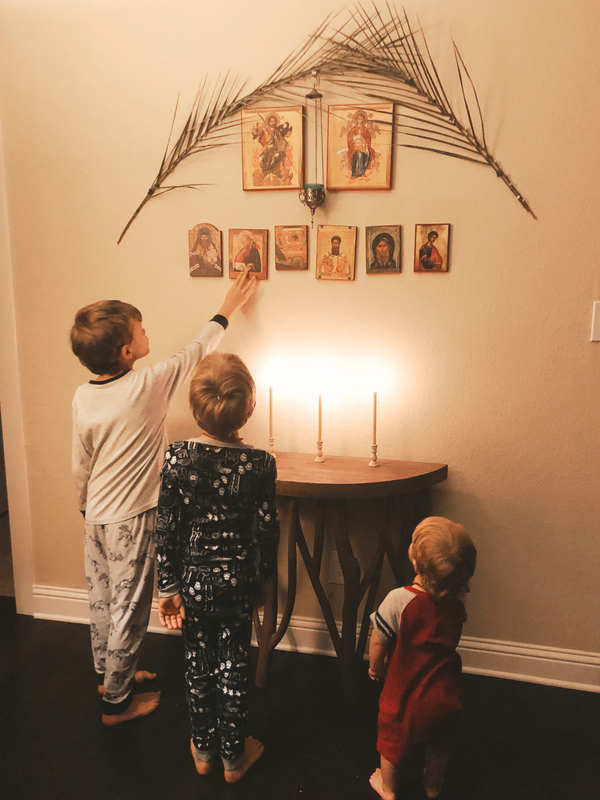 Tradtional Waldorf schools practice festivals like Michaelmas, Martinmas, St. Lucia’s Day, MayDay, St. George and the dragon….the list goes on. All I had to do was add in our church calendar festivals/celebrations, and our school year was mapped out beautifully in a way that integrated our school/church life. 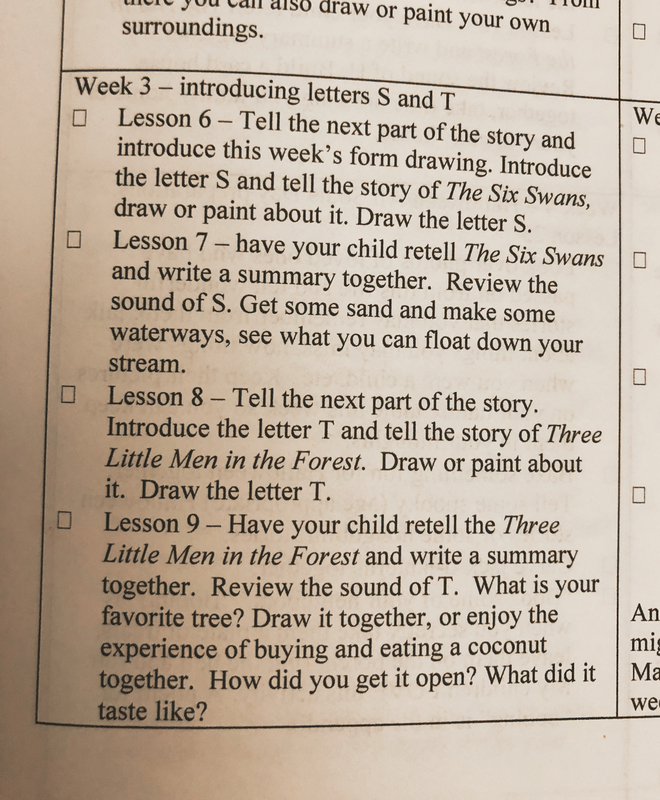 Each of these lessons has the language arts (learning not just to draw letters, but learning their quality), science (creating a waterway, seeing what works), math (the story of the seven swans has word problems in it), and narration in the retelling of the stories each day. Q. But why delayed academics? Won’t this mean that your kids are behind and won’t get into a good highschool/college someday? First of all– the idea that preschool and even Kindergarten are supposed to teach academics is a relatively new idea. We keep rushing earlier and earlier academic starts, and I think the burden of proof should be on our failing educational system, not on the way childhood development has been seen for hundreds of years. Full stop. In addition, education used to be about cultivating faculties within the individual student, about awakening the soul to a love of the world, not about downloading a set of skills preparing them for another grade. Instead, K-12 is now seen as a way to either get into a good college/get a scholarship, or to prepare you for the workforce. I agree that children should be prepared for the world, but if that’s ALL we’re aiming at, we’re setting our children up for a lifetime of being cogs in a machine. Being good at school just to get a good job does not honor the soul or the individual child. So, again, if what we’re after is a proficient student, earlier academics is the answer, because hey! More years to download skills! If what we’re after is whole souls, then we need to consider the damage we could be doing through early academics. Here’s an article that talks about how early academics produces long term harm. Secondly, a clarification should be made. Waldorf Education isn’t against academics– it’s against EARLY academics. Once a child reaches the 3rd grade, the curriculum speeds up greatly. Studies have shown that Waldorf students catch up and surpass their peers (who were doing things like formal math and reading the entire time) within months. Not only that, but if you take a look at the type of math problems 1st grade Waldorf students are tackling (without knowing they are doing math), you would think you were in a High School geometry class. 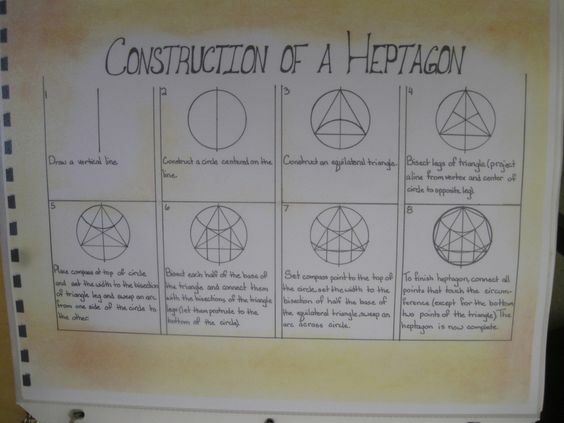 The fact that Waldorf students learn how to use art/geometry to derive the formula for the circumference of a circle before ever being taught a formula or “proof” flies in the face of every math book I’ve seen. Take these examples of ELEMENTARY math. (And yes, math was my weakest subject throughout my school years, and so I’m looking forward to going back and relearning everything!). 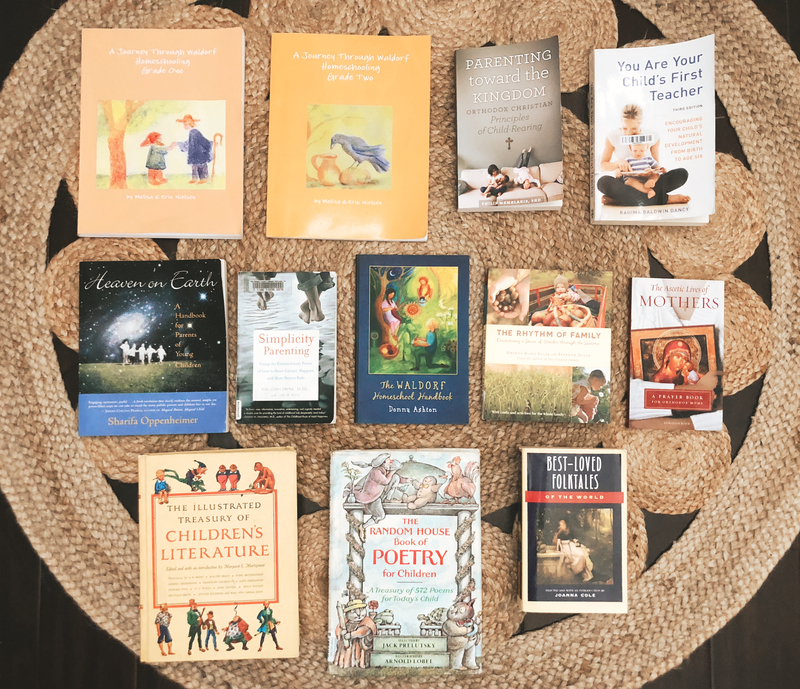 Delayed reading lessons seems to be the hardest part about Waldorf Education for many. This article on delaying formal reading instruction was especially helpful, and rings true for my experience. I don’t remember learning how to read. I remember that one day, it made sense, much like learning to talk. Anyone who’s ever tried to force a child to learn before he’s developmentally ready knows what a painful struggle it is! It was eye opening to learn that there is NOTHING wrong with a child learning to read at the age of 7 or 8! 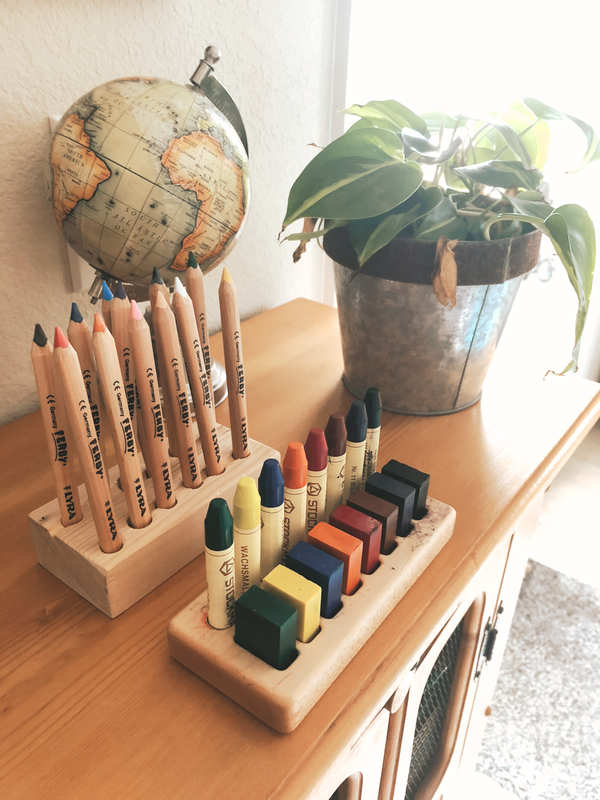 Q. What’s the difference between Waldorf and Montessori? Many others have addressed this better than I could. I think the two philosophies share a lot of common ground, but diverge on a few key points. 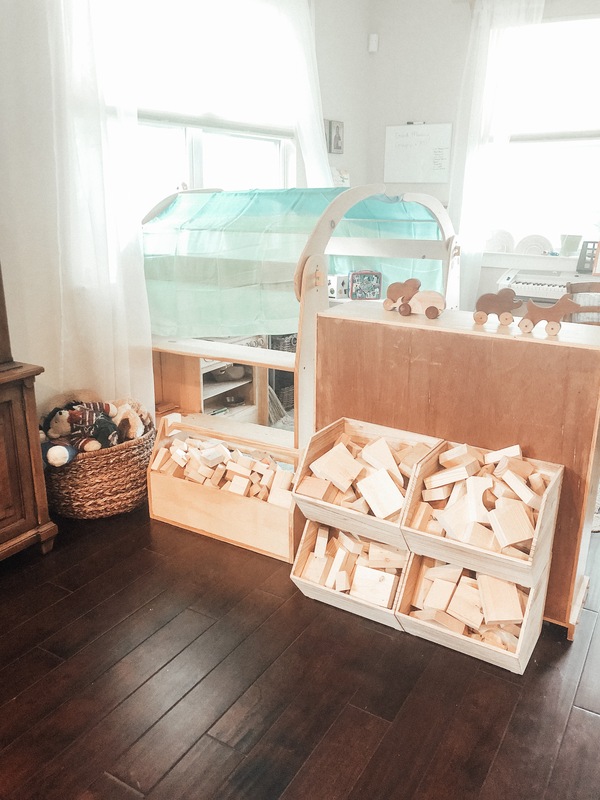 For us, personally, I think Montessori is too heavy on self-reliance and self-lead learning. 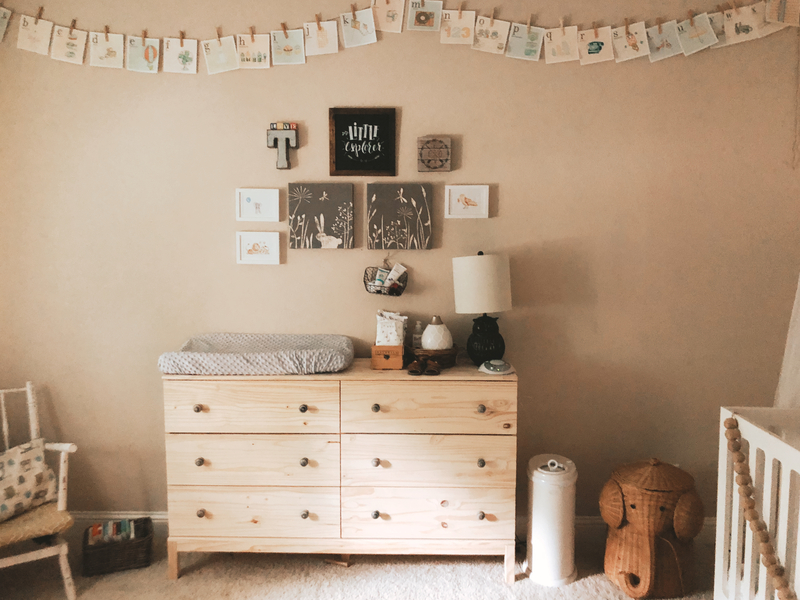 I think that learning to submit to the rhythms and seasons of life is essential, and that if the child decides HE gets to decide when bedtime starts, as is the case with a true Montessori bedroom set up, he is not learning to submit to wisdom from outside sources. 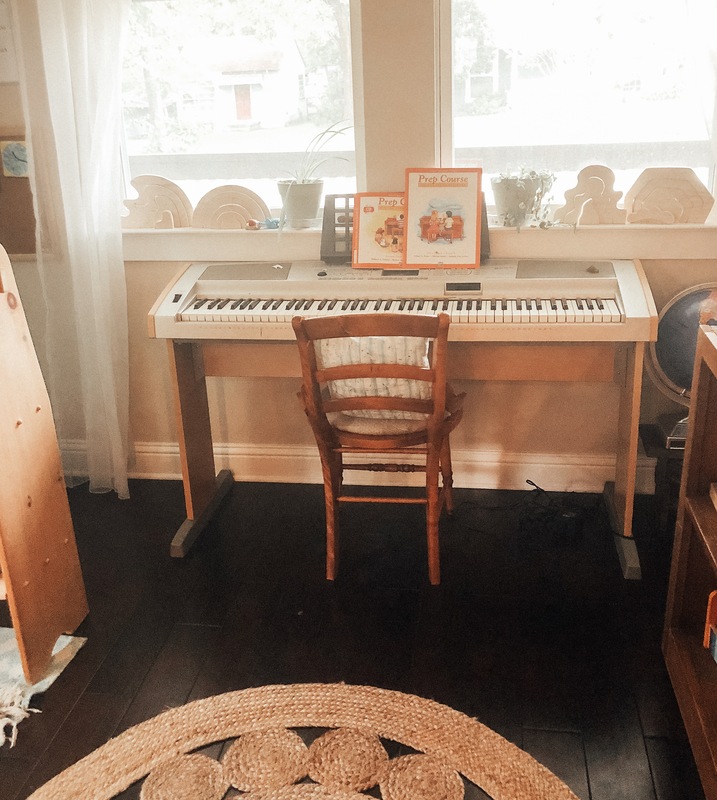 A respect and reverence for authority is absolutely essential for me to instill in our kids, and when I’ve talked with other piano teachers who have acquired Montessori students, it’s very difficult for them to respect authority and follow instruction. 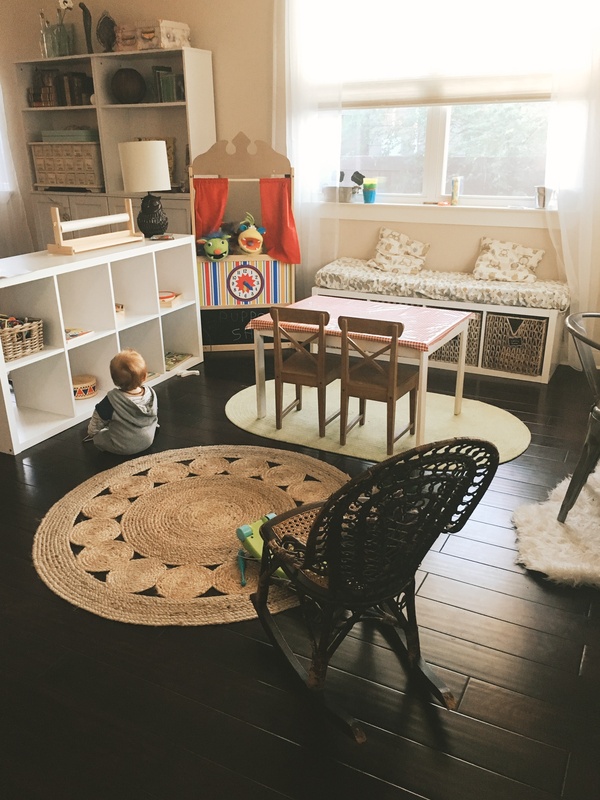 For me, that’s always been the deal breaker, and puts a finger on why I used to internally struggle so much with truly integrating Montessori into our home life. One of the ways Montessori is a winner is that it is more common in the US. You won’t finding anyone object to sending your kid to a Montessori school, because it’s a known quantity. 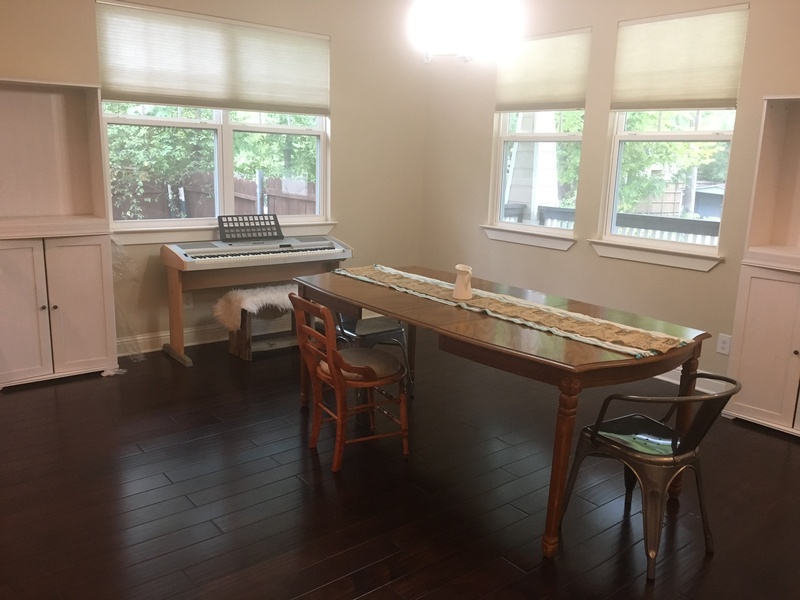 You would also be hard pressed nowadays NOT to find a Montessori school near you, and in Dallas, we have several Montessori charter schools that are part of the public school system and open to everyone. 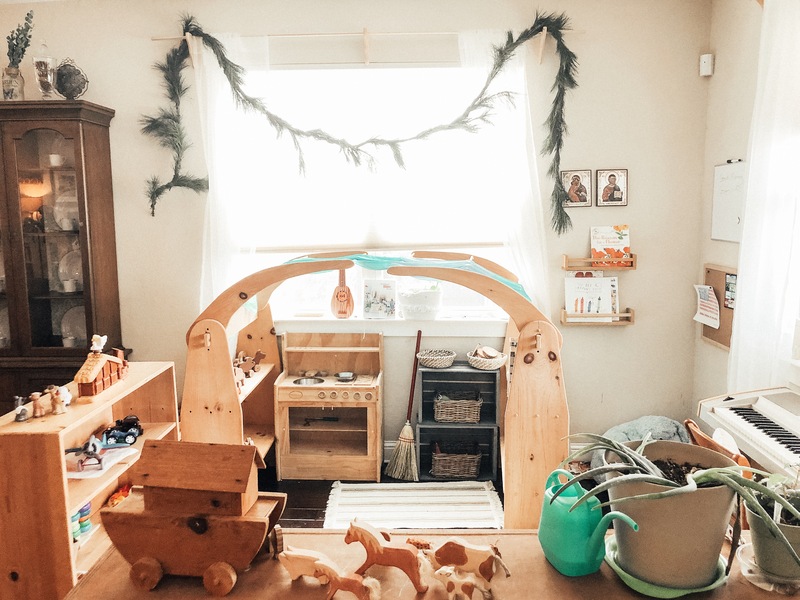 In contrast, it is much harder to find an actual Waldorf school, and as such, it leaves parents with only the option of homeschooling if they want to pursue Waldorf Education for their children. That is not a doable situation for many! Luckily there are many public schools that are seeing great results when they’ve integrated Waldorf into their curriculum! Take this public school in Sacramento, for example! Q. You mentioned Charlotte Mason– how do you plan on integrating the two? I LOVE Charlotte Mason’s philosophies on education, and plan on implementing a lot. 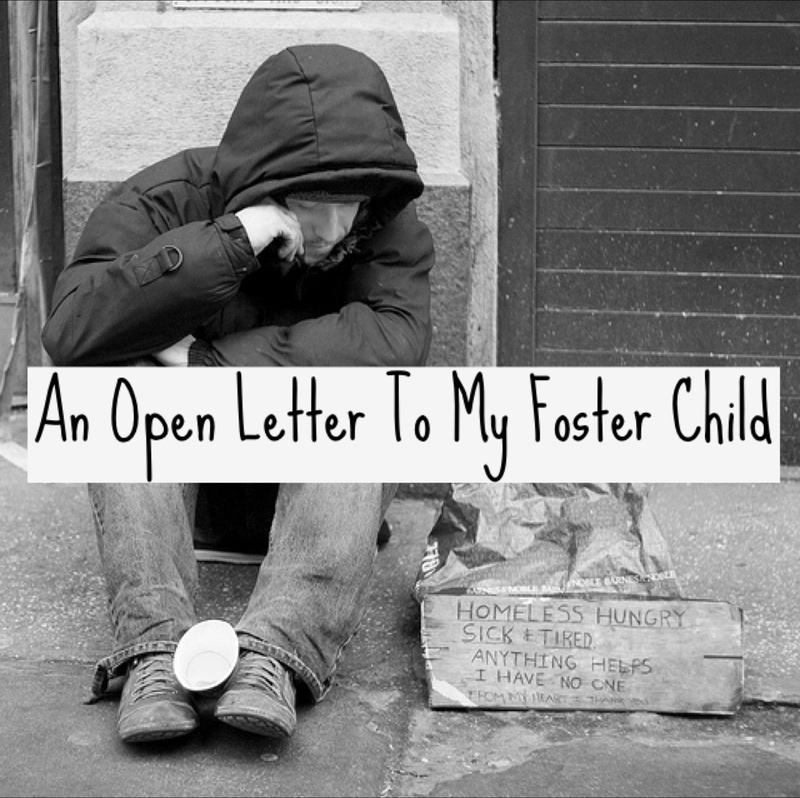 Here’s a great article that addresses it (this lady’s blog is a fantastic resource I return to time and time again!). Before we go, a few more resources! This is my Waldorf Pinterest board, which I’m continuously adding to. Feel free to follow/borrow. This is my Amazon Waldorf Shopping List, which I’m also continuously updating. Again, feel free to follow/borrow. 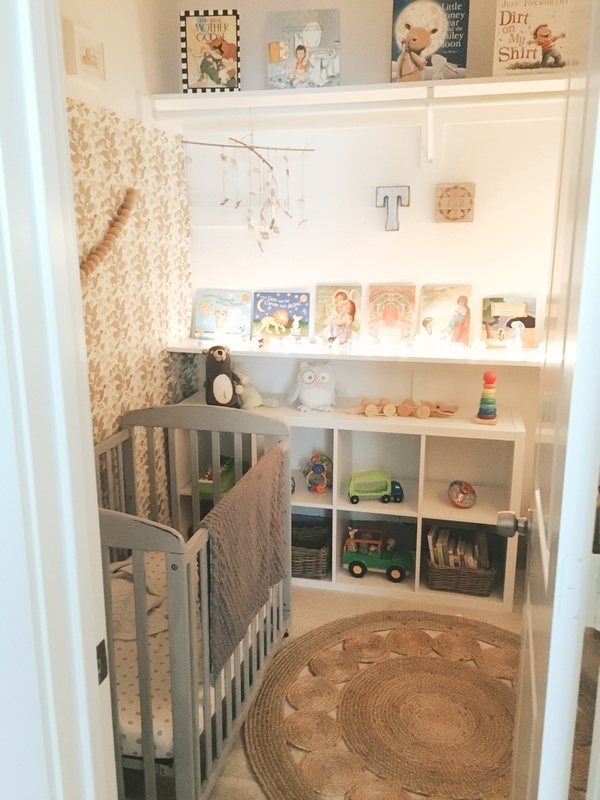 We’ve been living in our new house for almost exactly a year now, so I think it’s time to actually take pictures of the boys’ rooms! 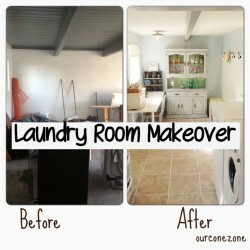 Perhaps I’ll even get around to writing a post about the whys and whats of our move? Too far, too far, haha! 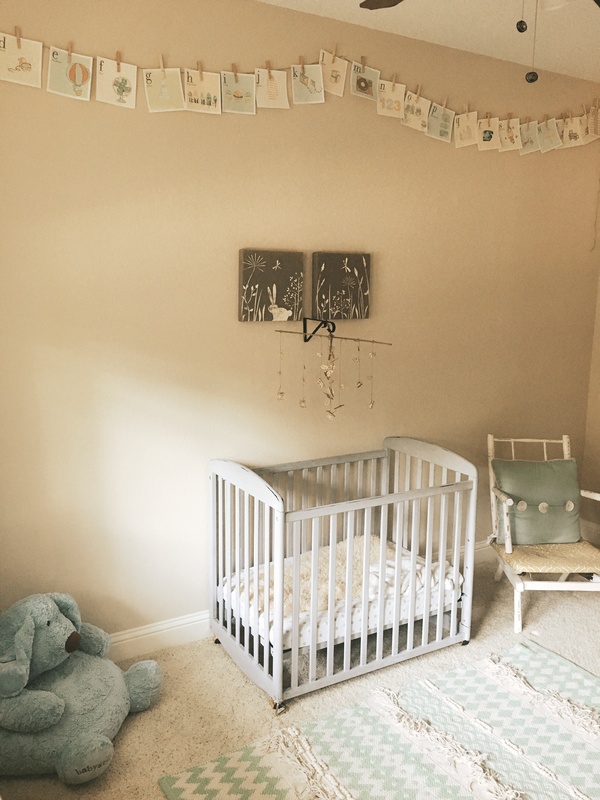 When we first moved in, this room was the dumping ground for all of Thomas’ furniture from the old house. We just needed his bed/changing table/toys set up right away so he could play while we unpacked. The school year started just a few weeks after we moved in, so it was actually a few months before we realized that this room wasn’t a good fit for him at the time (I was walking back and forth across the house to nurse him 2-3x/night, and since the boys’ room is next door, his light-sleeping tendencies were a problem during the day). 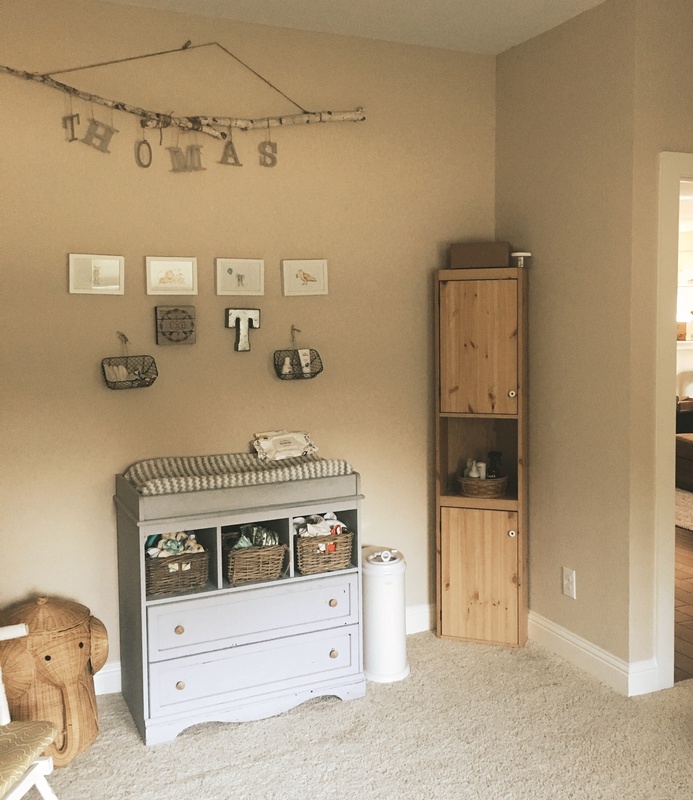 So for a time, this room was my office and our huge master closet was Thomas’s bedroom! It was such a cozy little set up and I’ll miss it for sure 🙂 He was right next to our bed for all his night time nursings, and he was able to become a much better sleeper due to the quiet and lack of light. 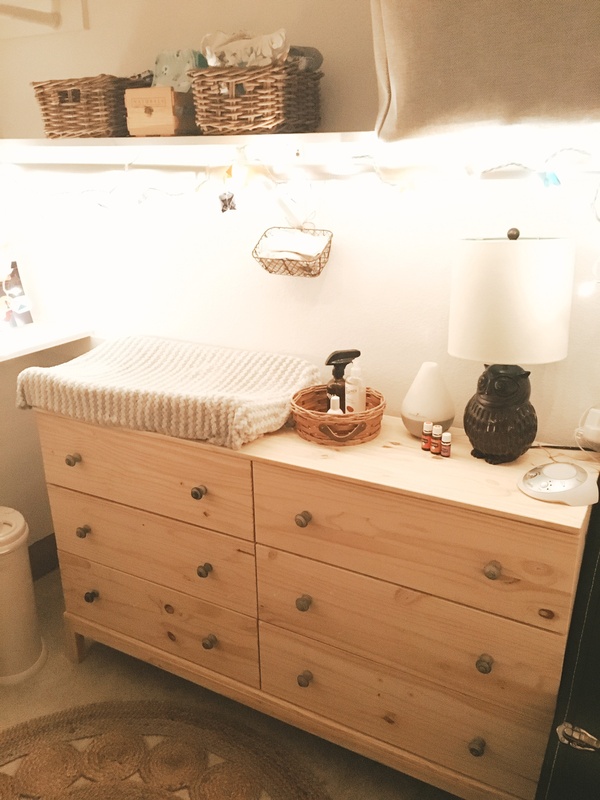 We kept the same dresser/changing table as before because I love how the drawers fit all of his things! 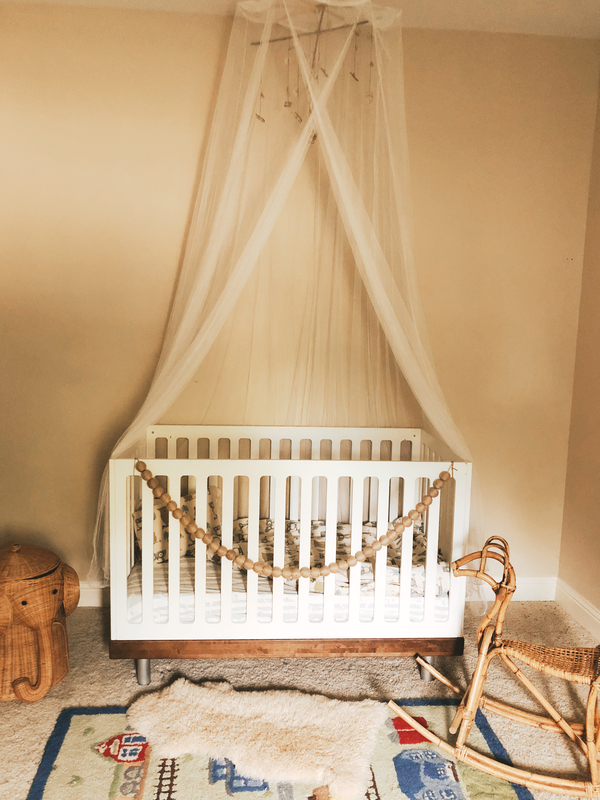 I have plans to stain the natural wood to match the crib….when I get the time 😉 We have a sample of Ecos wood stain on its way, so we’ll see if it’s a match! 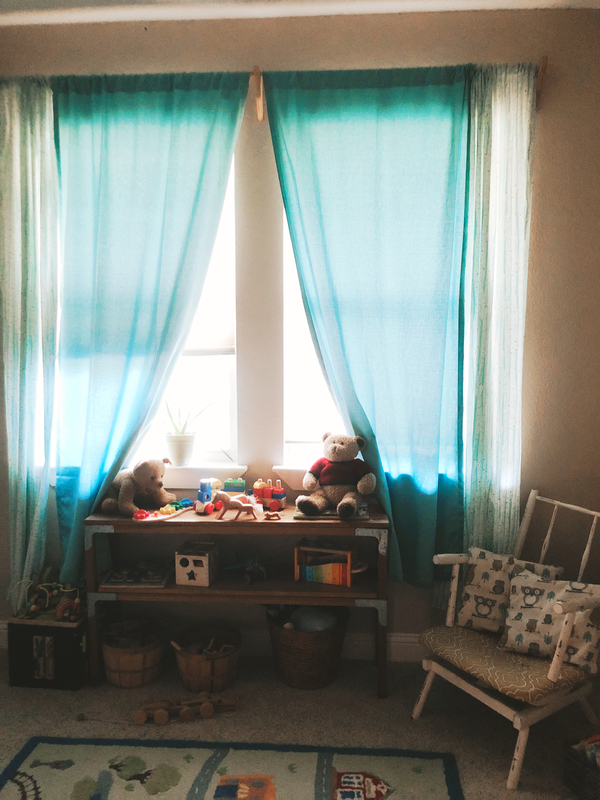 We moved all of Thomas’ toys near the window because he absolutely loves the sunshine. 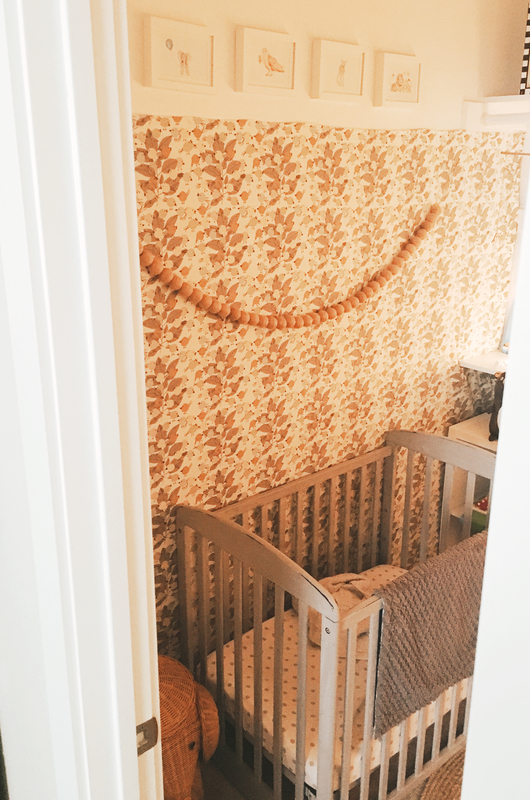 And then of course his rocking chair and Sandra Boyton books! All three of my kids have loved her books and the boys are getting such a kick out of reading these same stories to Thomas now!